The Holiday season is in full swing! 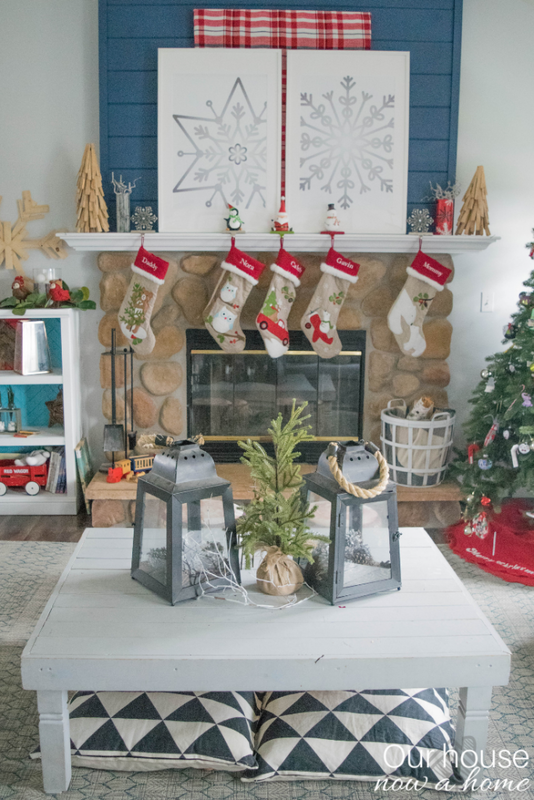 Today I all about decking the halls, hanging the stockings by the chimney with care and my Cozy & Simple Christmas home tour! 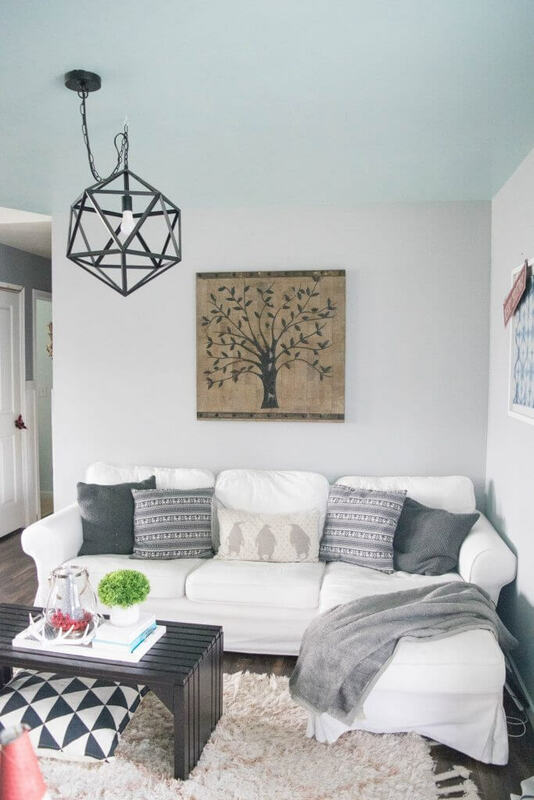 I like to share my home on this blog, my ideas and talk home decor. 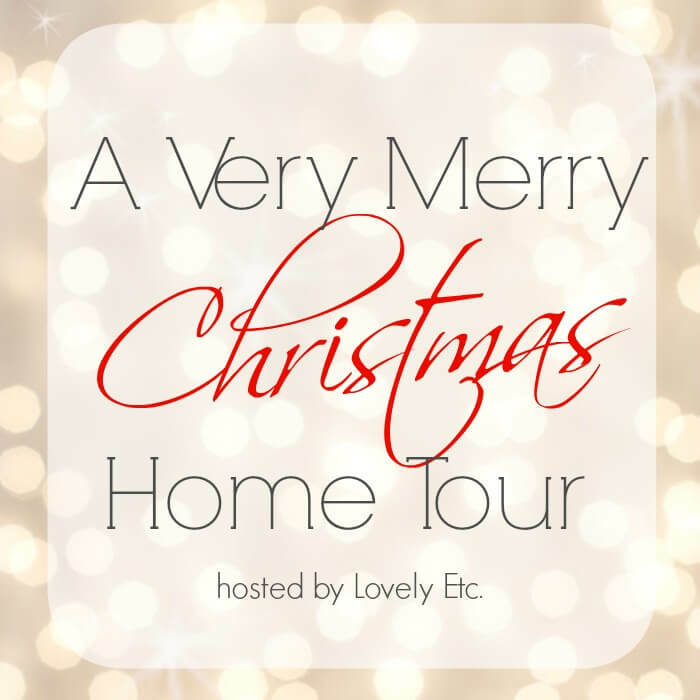 To give even more inspiration today kicks off A very Merry Christmas home tour hop! 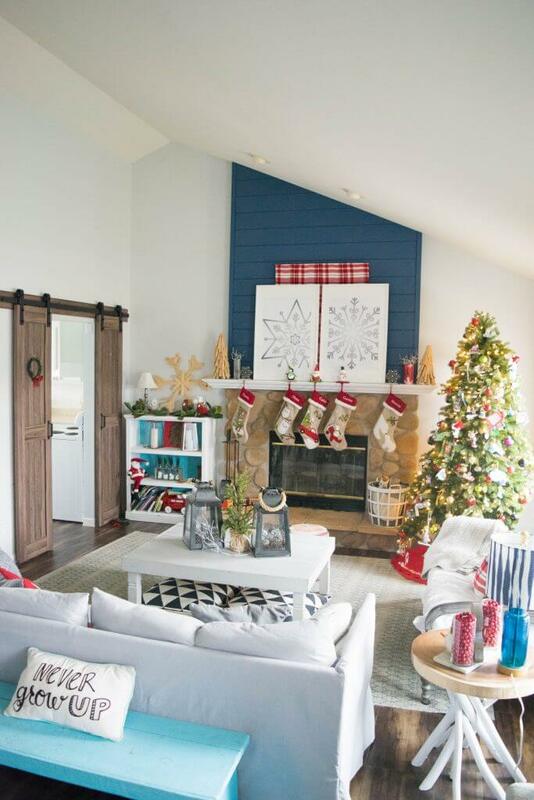 27 amazing homes decorated in their wonderful holiday cheer will be shared all week. If you are coming from Love & Renovations, welcome! 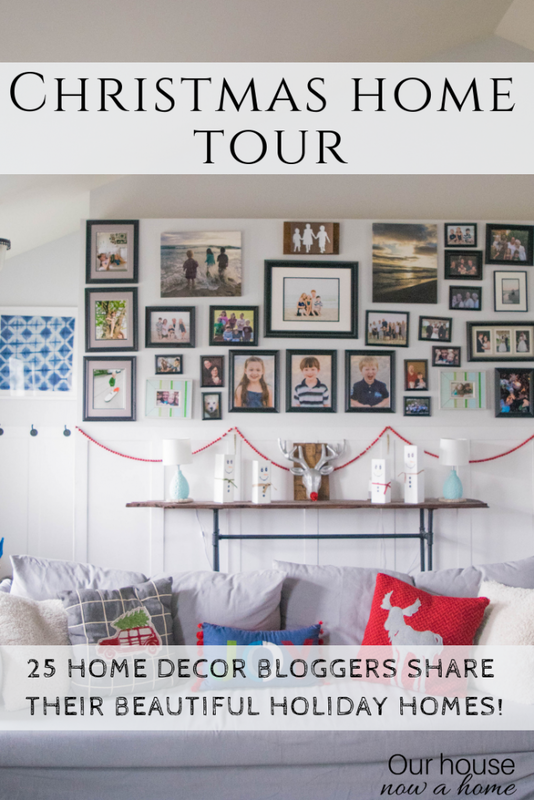 The rest of the home tour hope will be shared at the bottom of this post, with new links added each day. I am so excited to kick off the holiday season! Just yesterday we had a massive snowstorm hit us, blizzard conditions and tons of snow. 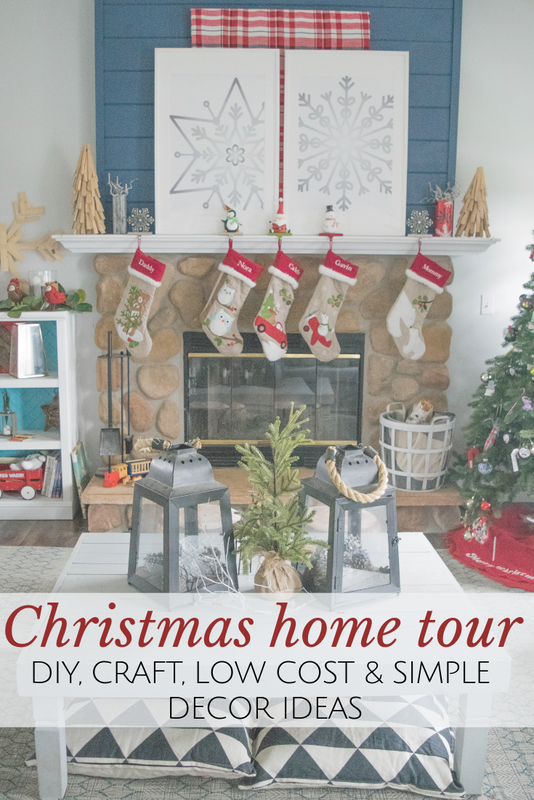 So sharing my Cozy & Simple Christmas home tour feels like the perfect thing to do today, other than hibernate (which I want to do until spring). 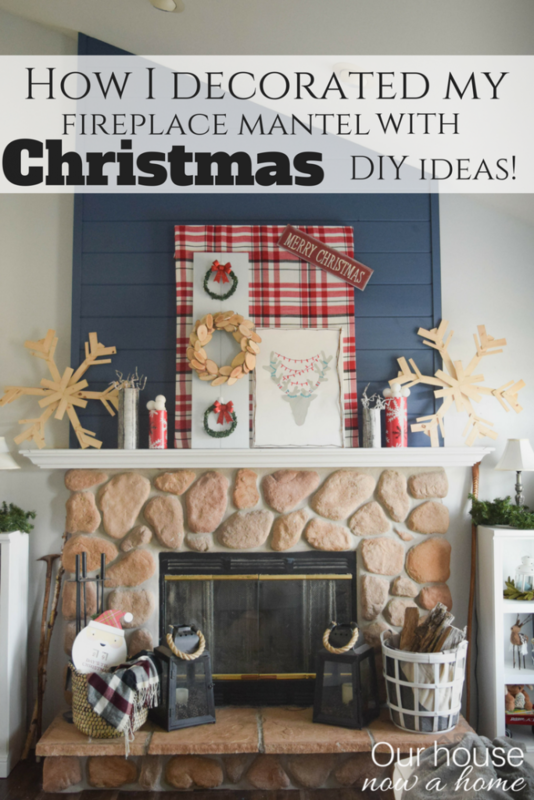 Since a lot of my home is decorated with holiday DIY ideas and Christmas crafts I will be sharing all of those links at the bottom of this blog post. 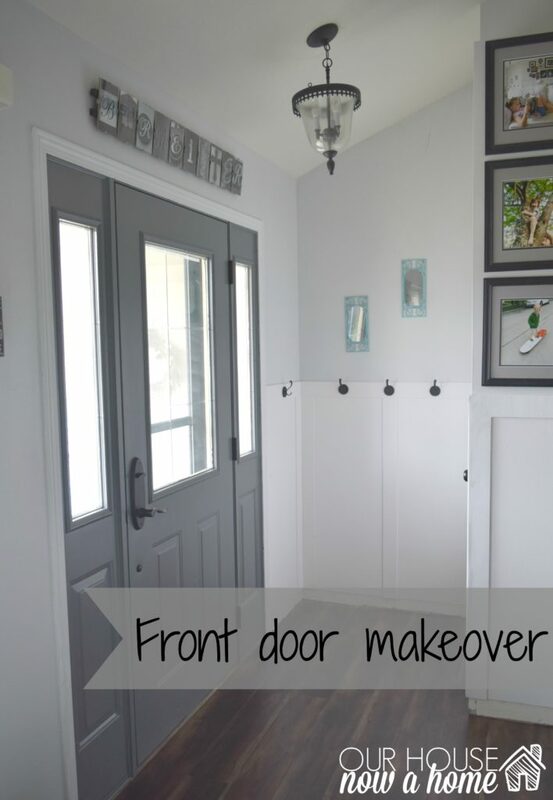 I try to make it as easy to find my DIY projects as possible. 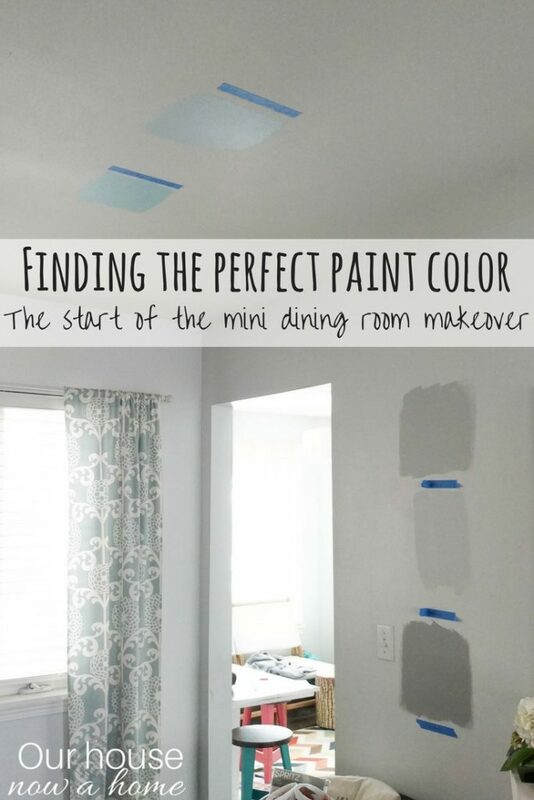 You can also leave a comment if you have any questions on the decor I share. Ok, onto the fun Christmas decor! We have little-ish kids in our home so I am rocking the whimsical and fun decor until my kids are old enough to roll their eyes at it. 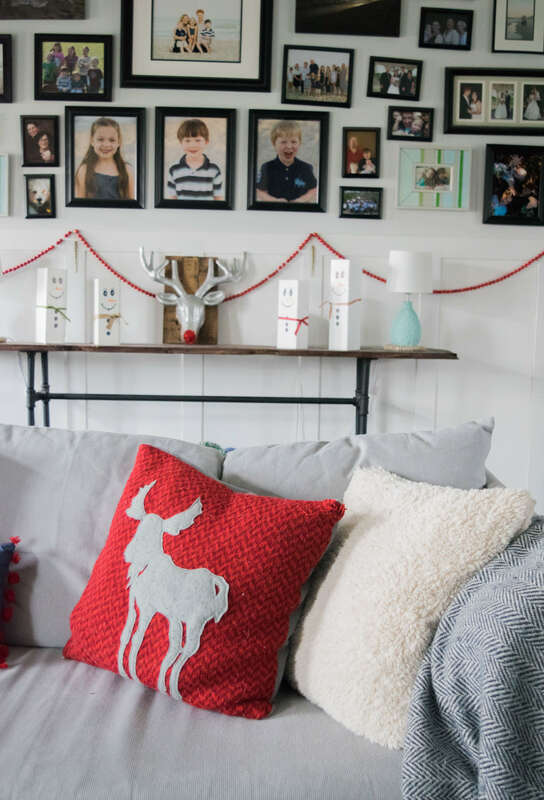 With them being 10, 9, and 7 they still love all things Santa, Rudolph and snowmen. 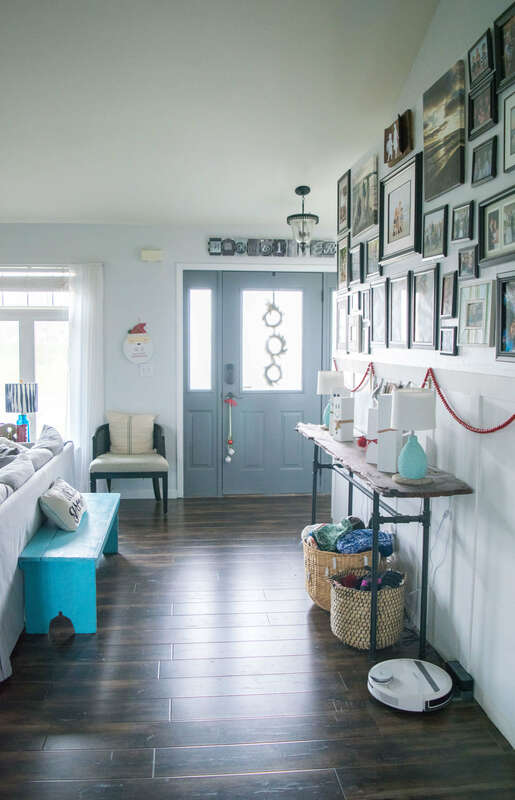 My family is in the young phase of life still so I like to decorate with lively colors, fresh textures, whimsy touches and a casual feel. 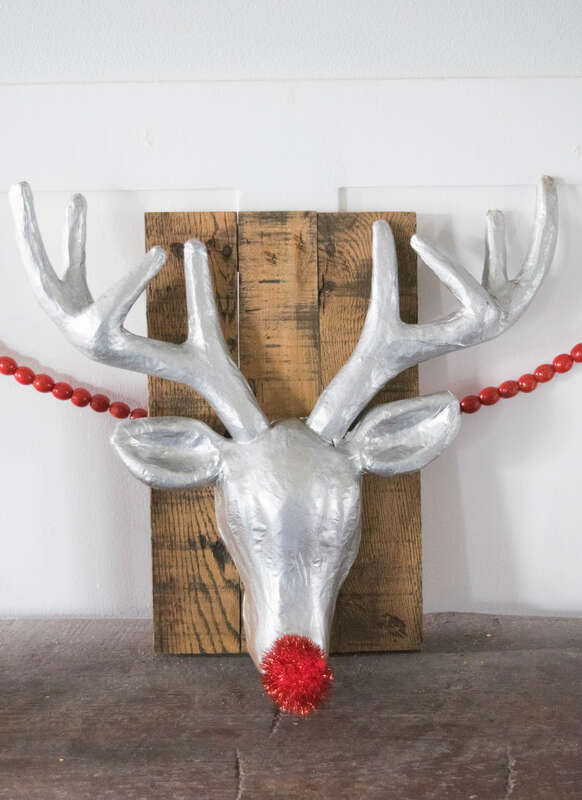 When decorating a home the holiday season needs to reflect the people living there, so if you are classy and fancy; class up your Christmas decor! 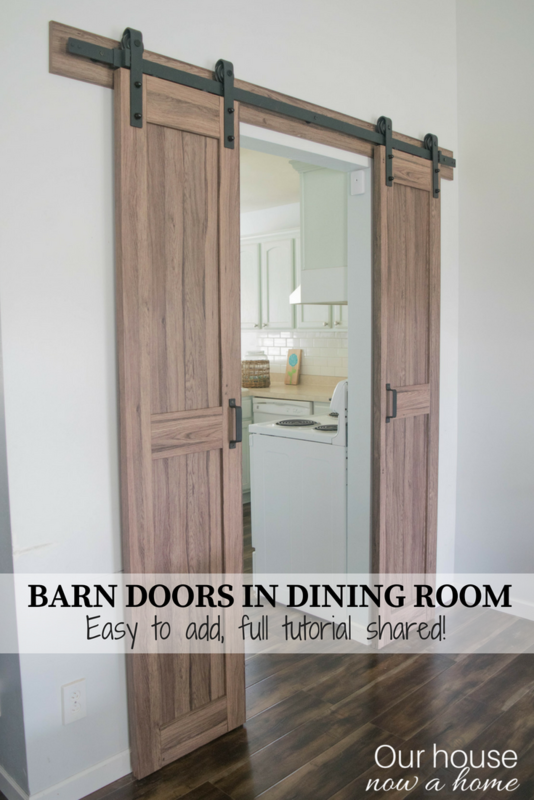 If you are farmhouse chic, let the country style flow! 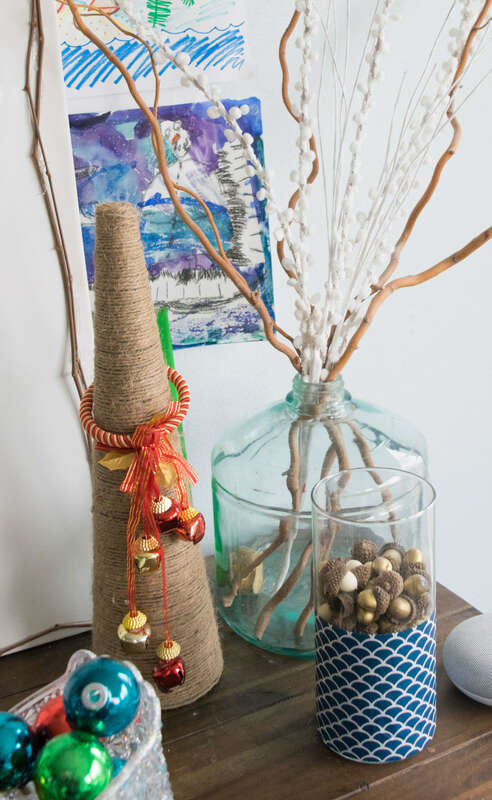 Making a home festive does not mean compromising on the year-round decor in the home. 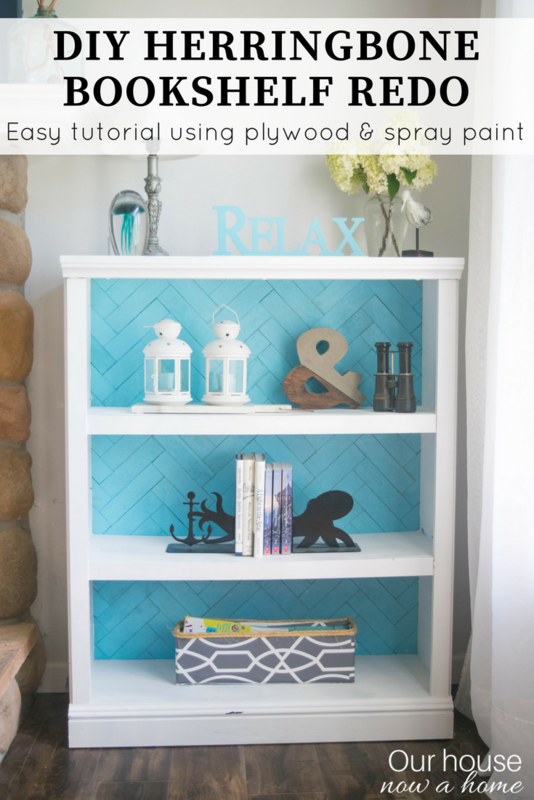 I sprinkle in light colors, blue with a hint of rustic. 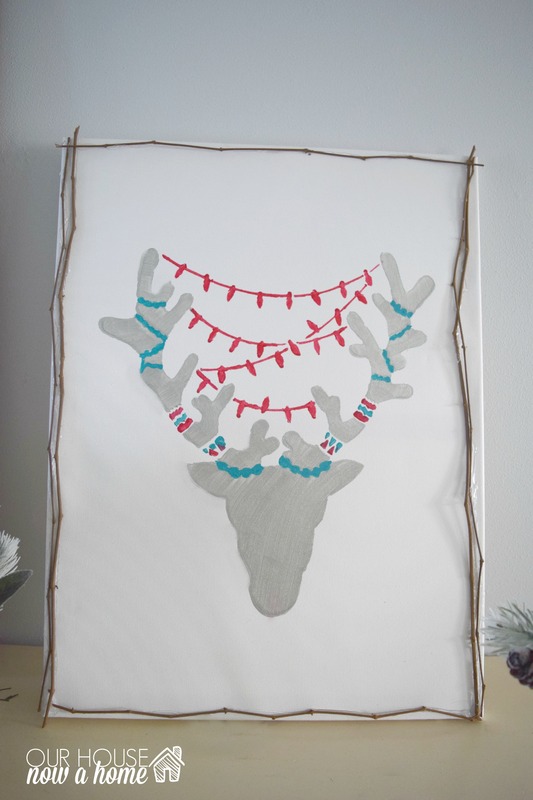 This little reindeer I made and is as close to a deer on the wall we will ever get. Living in Wisconsin this time of year also means hunting season, but neither Dale or I grew up doing that. So we just sing about “Rudolph the red nosed reindeer” and use pom-pom balls for the nose. That little bit of whimsy coming out in the decor. For anyone that is a frequent reader you may have noticed my living room is arranged differently. 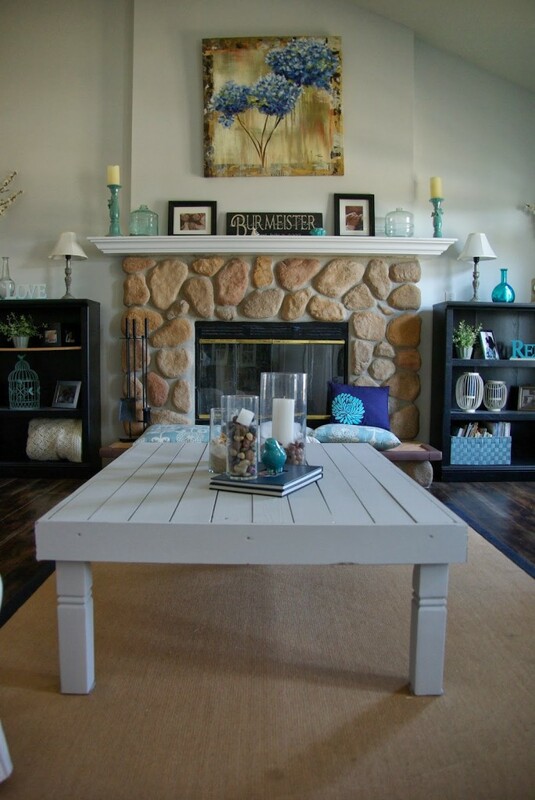 I removed the big farmhouse table out of this large room. So what was a great room with a dining room/living room combo is now just a living room. There is a few reasons this was done, which I will lay out with a post soon. Nothing big, just the typical growing pains of a house with kids and life always changing. My home will forever be a work in progress because a new phase of life means our home needs to function in a different way. 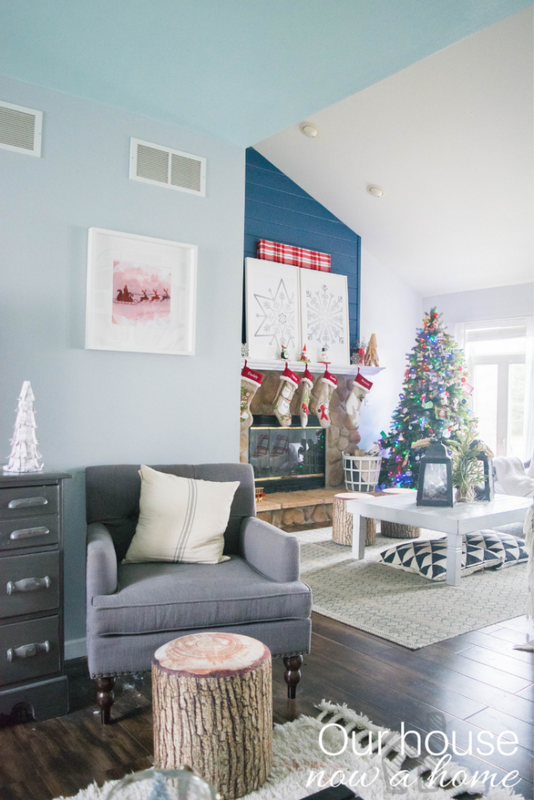 Because of this change we now have a wonderful formal living room for the holiday season and I am loving it! My dogs are very happy to have their precious daybed back in the living room. It is the fanciest dog bed I have ever seen, but they have claimed it as theirs. 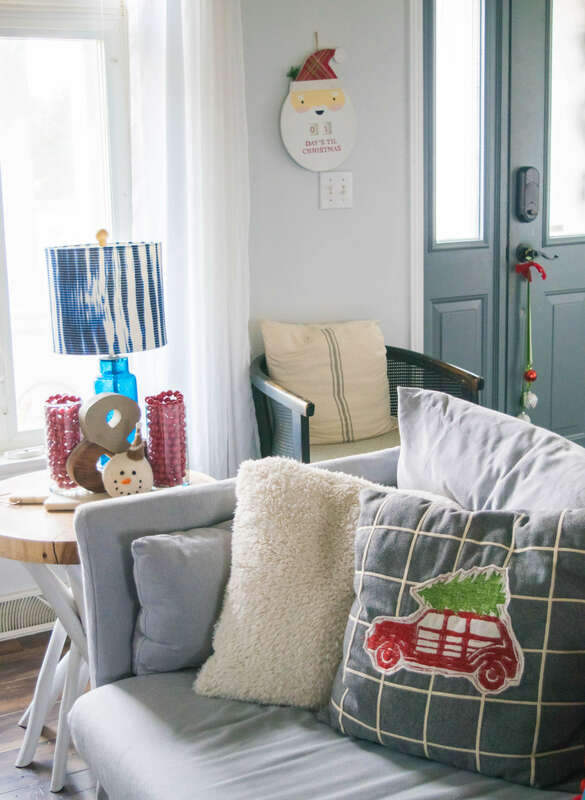 This Cozy & Simple Christmas home tour is jam packed with easy decor ideas. Simple ways I transition my year-round decor into working for the holiday season. 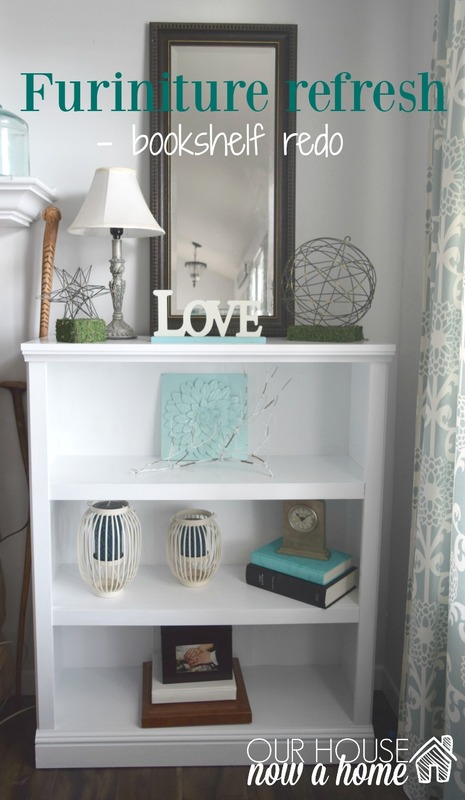 Next week I will share those quick and easy transitional decor accents. 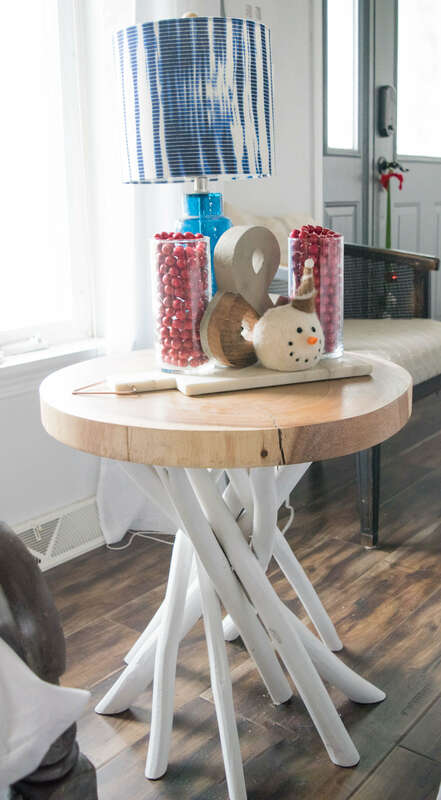 I am all about simple decor, I have three kids with a large extended family and friends in the area, we are very busy during the holiday season. 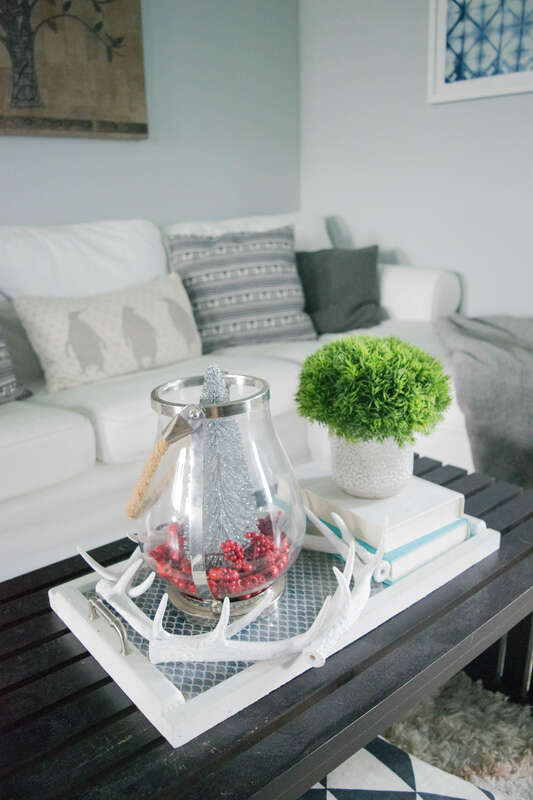 Even with my blog I need to have simple decor, I need the changing of the seasonal decor to be as streamlined and low maintenance as possible. 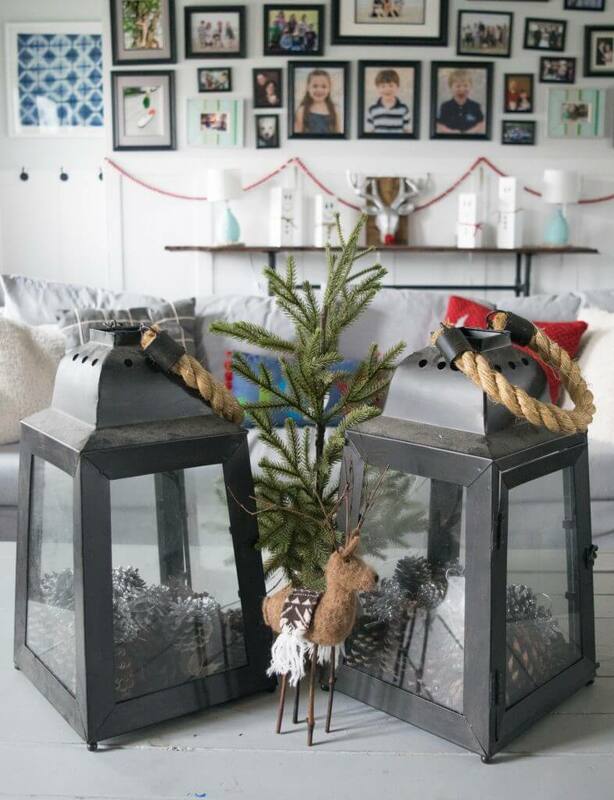 So I will be peeling back the decor process, sharing how I am able to create a winter wonderland in my home in one afternoon! 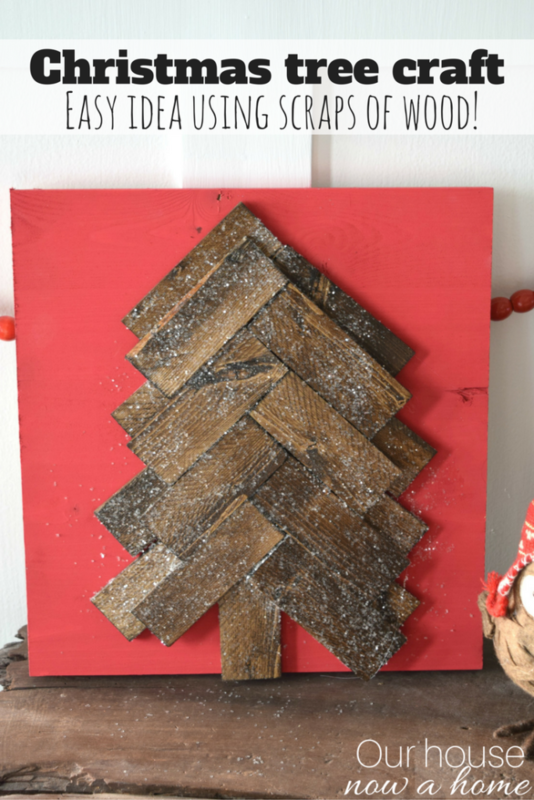 There is a new addition to my Christmas decor this year, I got crafty and a little techy and created my home Holiday wall art. 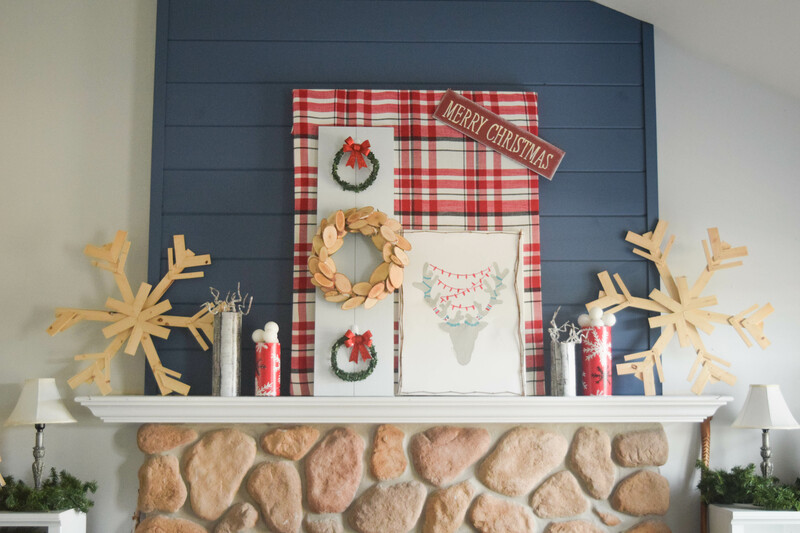 On Friday I will be sharing the free printables for the wall art on my fireplace, the art above the daybed, as well as many others that I created but ran out of wall space for. 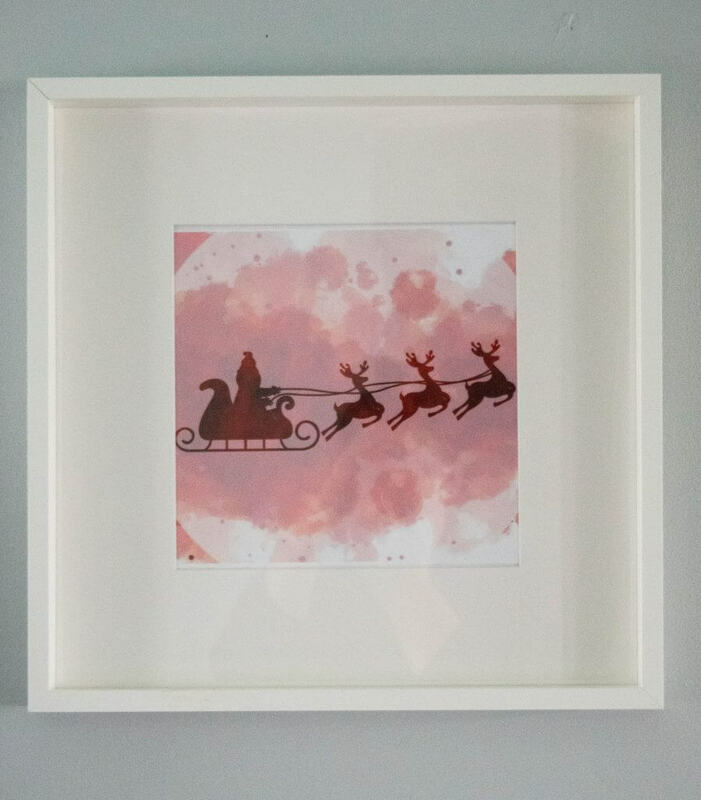 The art was crazy simple to print out and I added to a large frame. 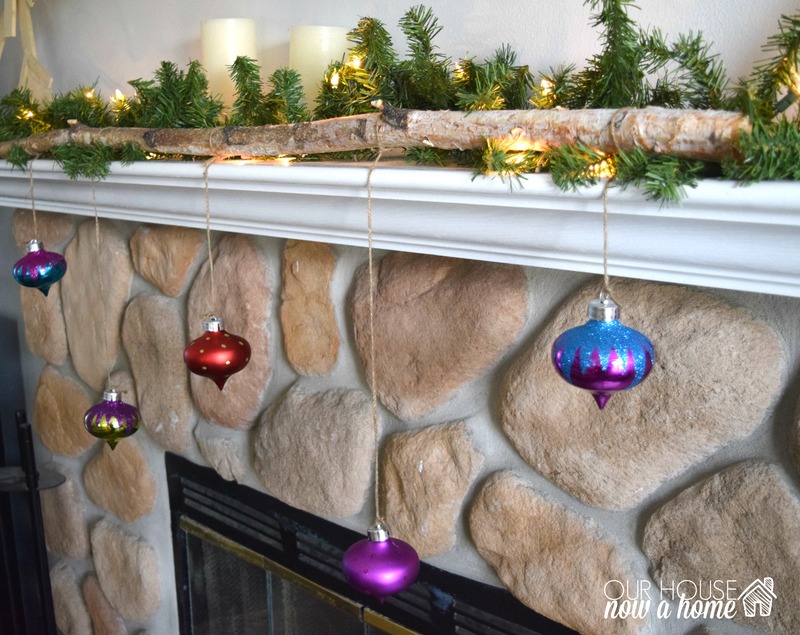 Simple and low cost for a big change to the fireplace mantle. 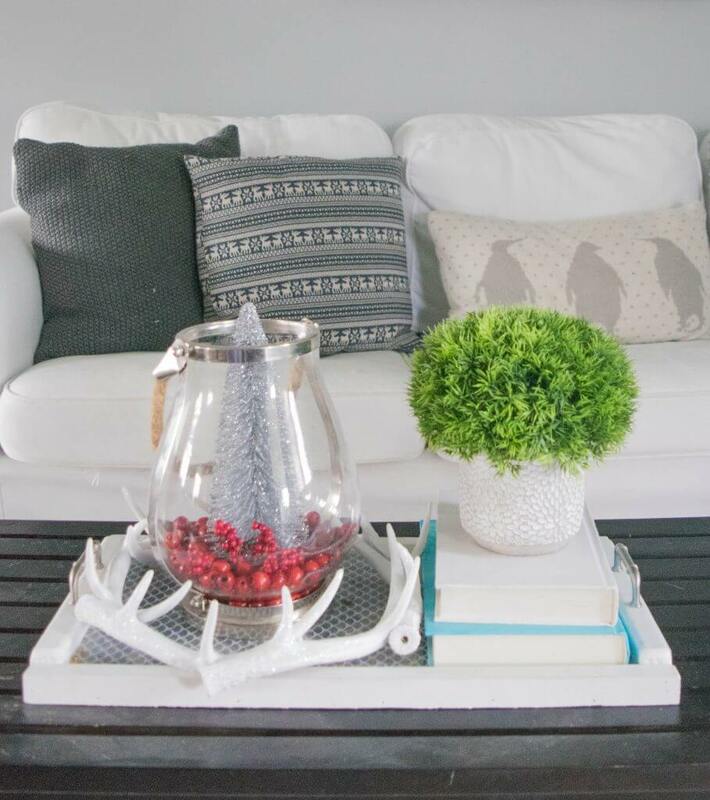 One aspect I love about decorating is bringing nature to the decor. With Christmas it feels even more authentic to the season. 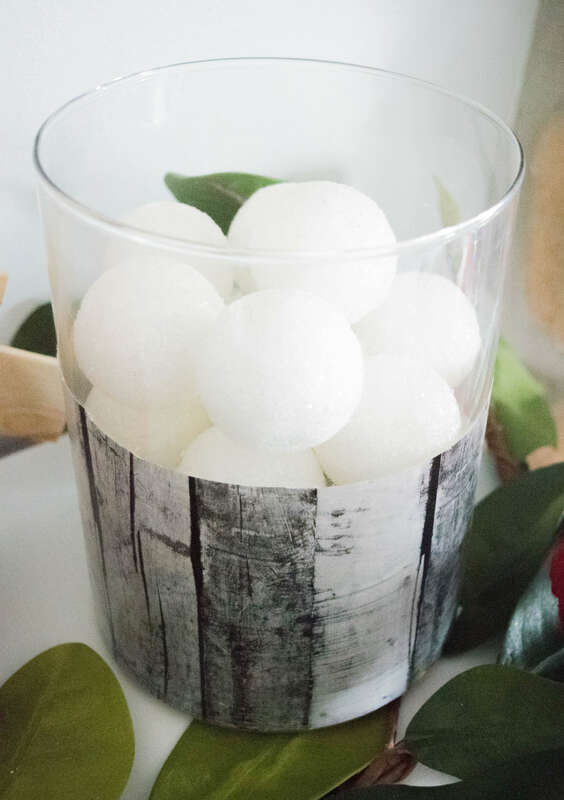 Adding sticks with “snow” onto them feels fun and festive. Christmas trees have been made like crazy to decorate my home. Going a more natural route with wood tones allows me to make the dark navy blue and other blue colors blend together for my home. When we first purchased our home and had our daughter I went super traditional with the holiday decor. 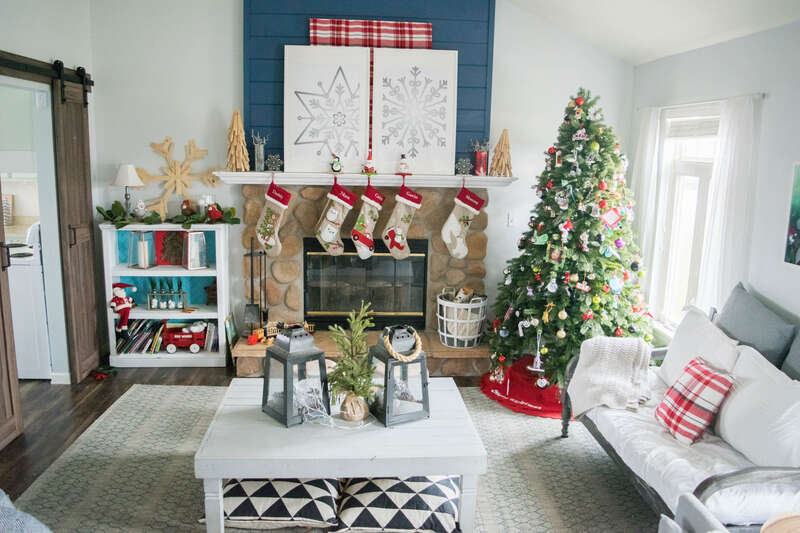 There is nothing wrong with that, but as I started decorating year-round with more patterns, blues and grays the Christmas decor felt out of place. 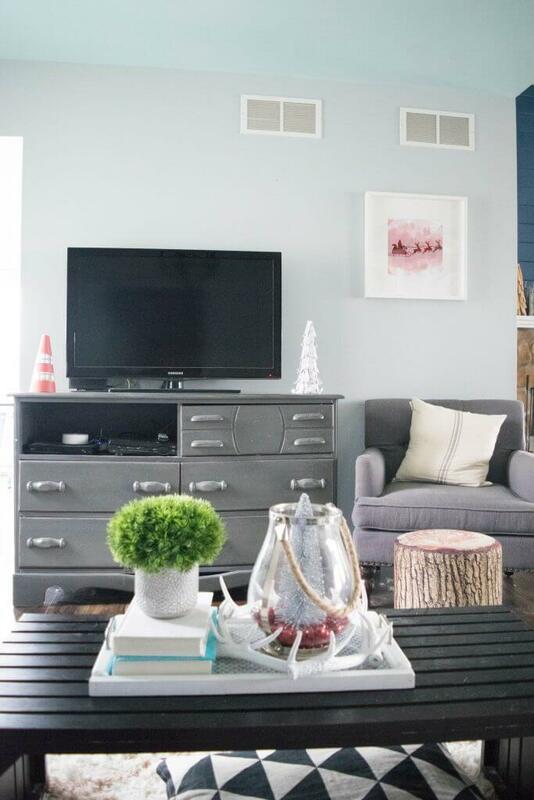 Going with more nature elements, whites and wood tones helps it all be cohesive. One way I decorate and will never falter from is making my Cozy & Simple Christmas decor be personal. Christmas is the most wonderful time of the year (yes, I went there), my kids will look back on these days and see magic. 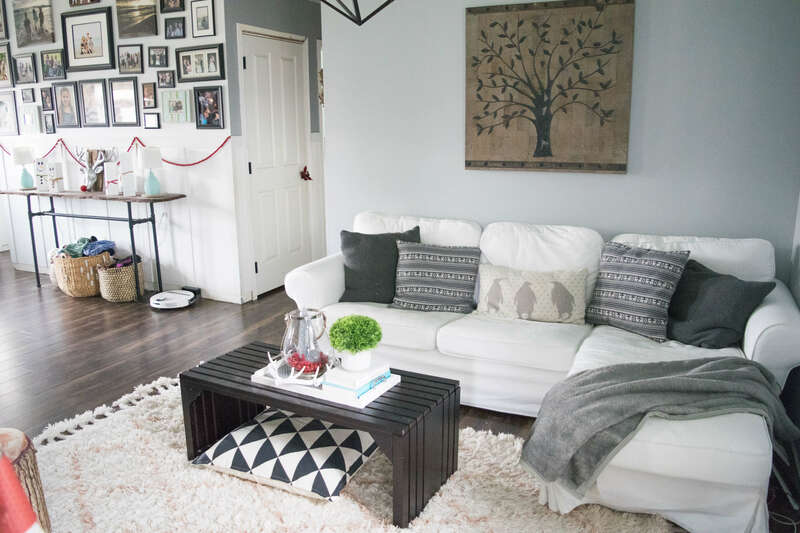 I will forever compromise on style, what is “in” and anything else I have to in order for my home to be what it is for our family. 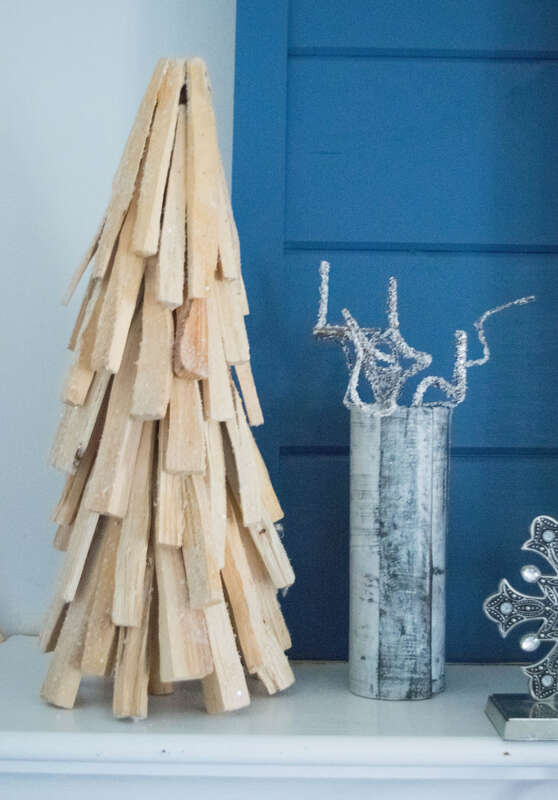 I drool over people’s stunning Christmas trees with their wonderful themes. 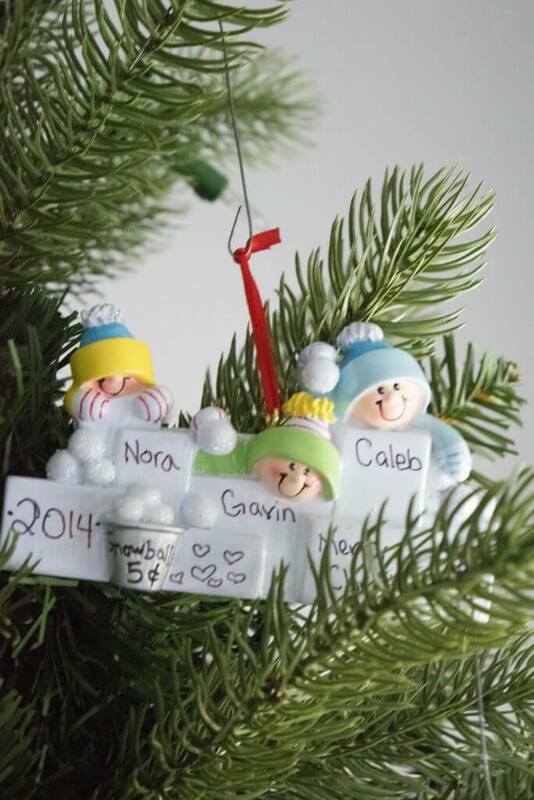 However, ours will never be that way because it is filled with special and sweet ornaments. Handmade kids ornaments, tokens of their tiny selves, toddler hand prints, preschool crafts, and now elementary aged kid ornaments. We also add a new ornament each year to commemorate that year. 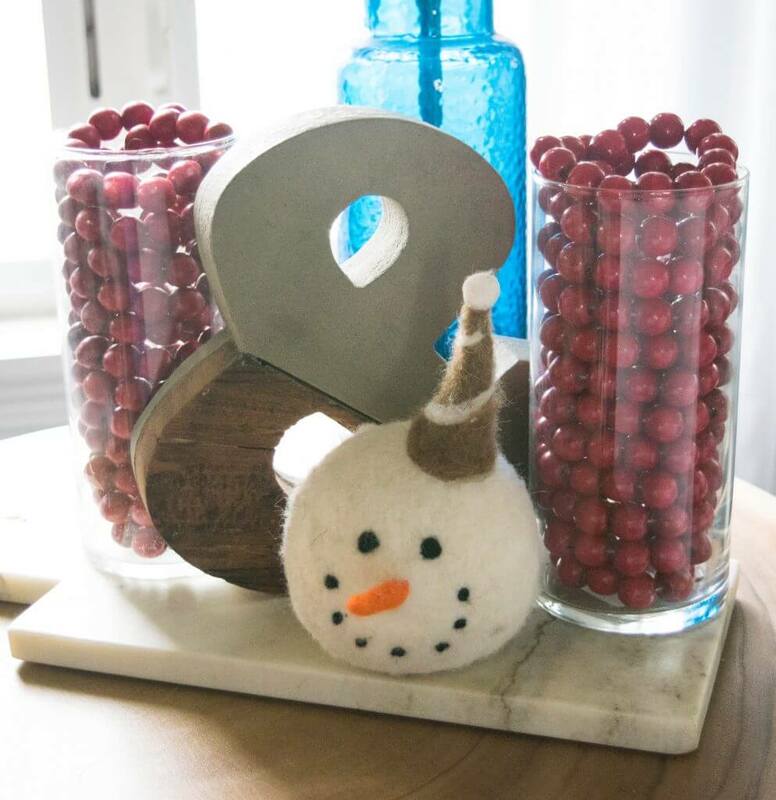 Those little touches are what makes our home magical this time of year. Yes, my decor helps set the tone but when it comes down to it what makes this season special is the people you spend it with. 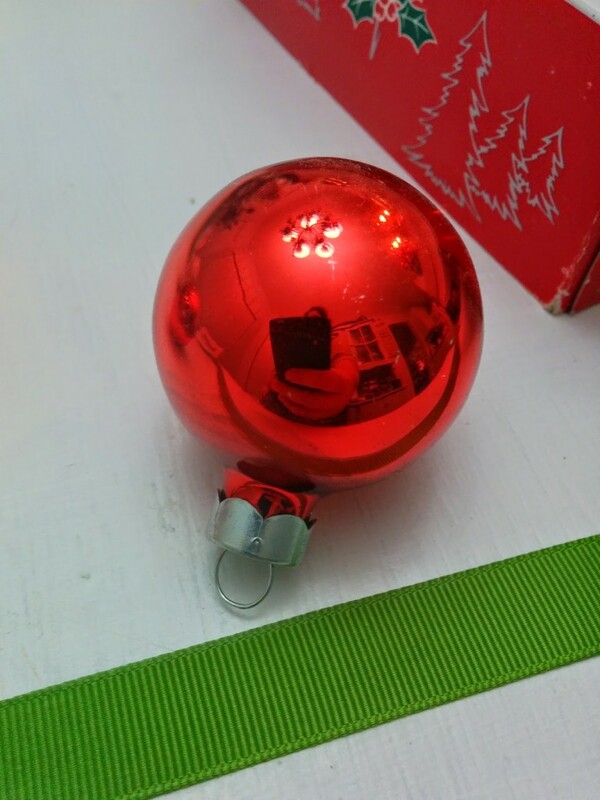 So we blast the Christmas music, laugh loud, sing along and my kids crowd ornaments in one spot when decorating the tree. I would not have it any other way! Maybe eventually our big time additions to the home will happen. Then I can have my fancy and beautiful themed Christmas tree. Another tradition in our home is pulling out the Christmas books, these only come out this time of year and my kids were so eager to get to read these. My oldest, Nora is a big-time book worm. 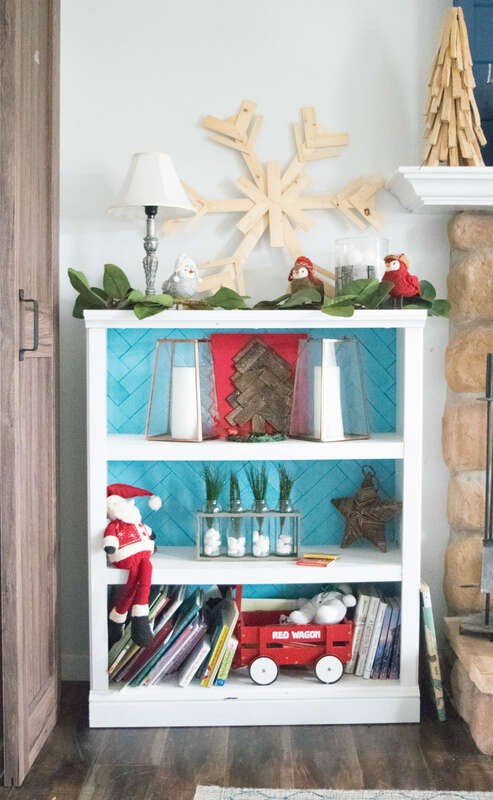 She was excited to help decorate for Christmas but within 15 minutes she was parked in front of the bookshelf lost in the world of Santa, Elves, snowmen and Christmas cheer. 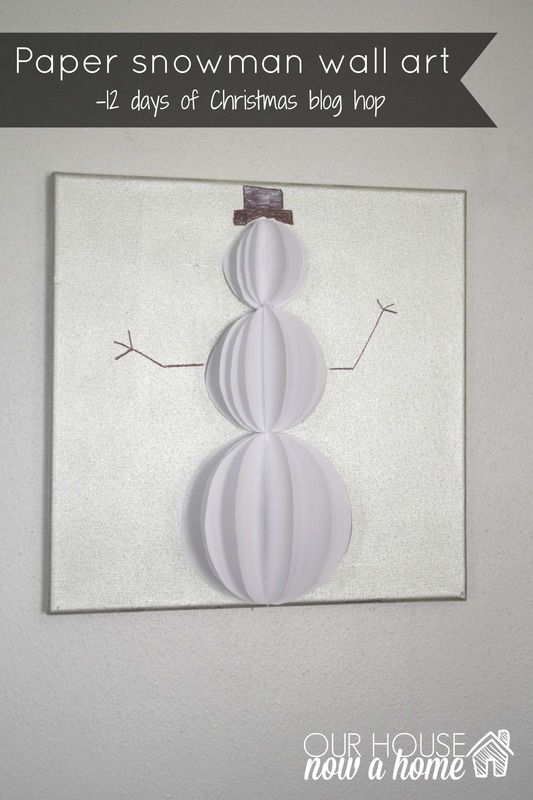 This big snowflake is usually on the fireplace, I made two of them and have loved them ever since. However, with the new snowflake wall art I made there was too many snowflakes happening on the mantle so I had to find a new home for these. Pause for a snowball fight! 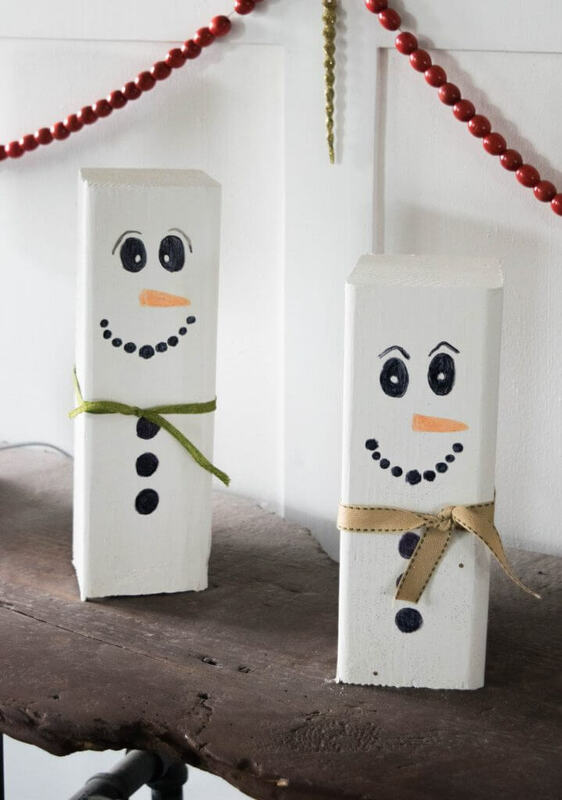 My youngest helped me make these a few years ago and he loved the process. 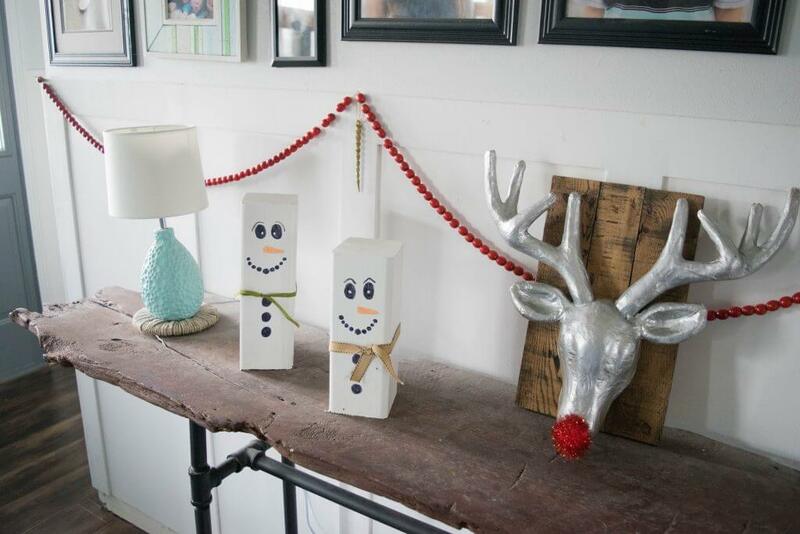 Decorating for Christmas can be fun, getting crafty with kids is the best way to decorate for the season. With the new layout of the living room there is plenty of room for gift opening! We are dealing with a smaller dinner table now because we are going to be repairing the large farmhouse table. 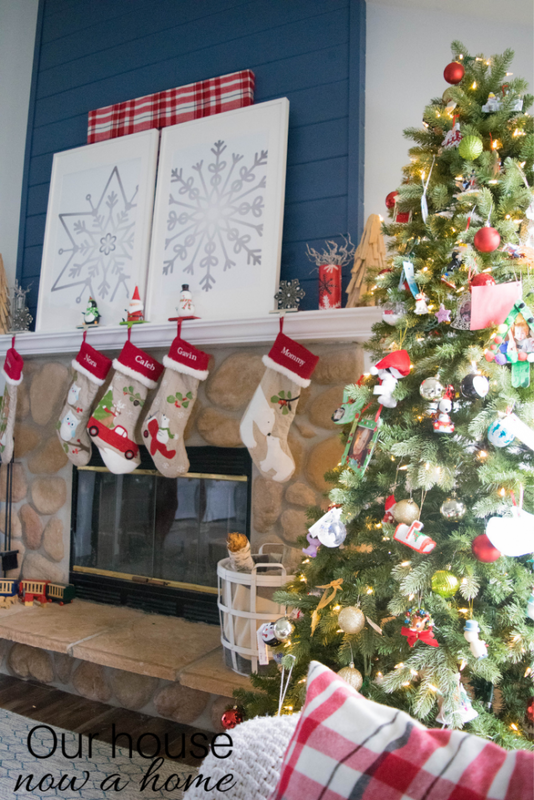 However, this time of year we do have people over for parties and cookie decorating, but everyone usually hangs out in the living room and family room. So having more seating to relax and enjoy our guests works best for our family this time of year. 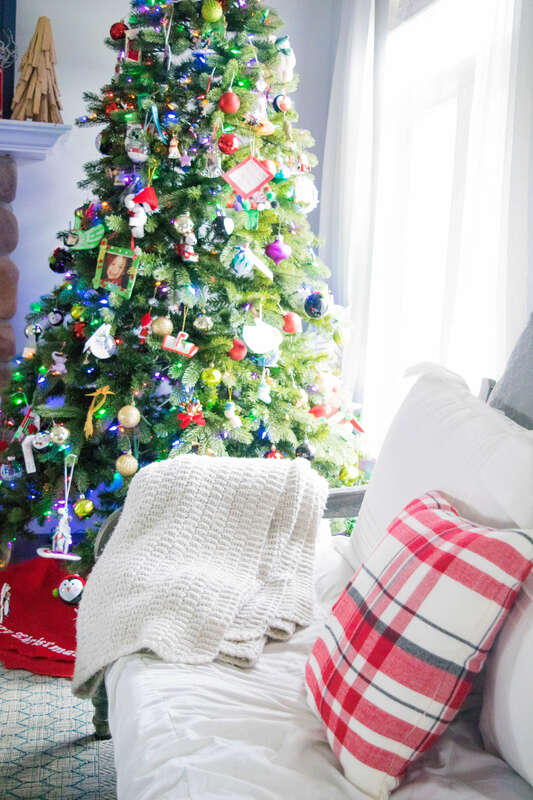 Sofa pillows and throws help with the Cozy & Simple Christmas home so much! I always want our home to be the place everyone feels comfortable. 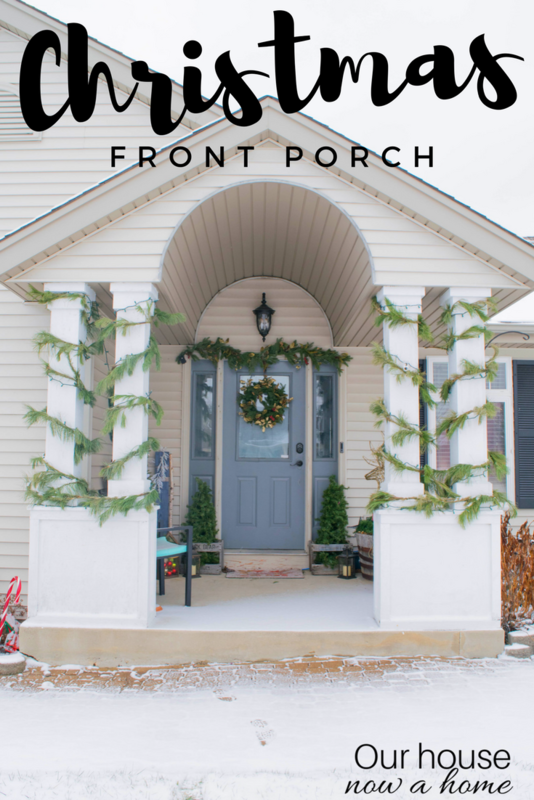 Come in, warm up, listen to music, laugh really loud, make memories… this is what I have always dreamed for my home year-round, but with Christmas that is kicked up a ton. 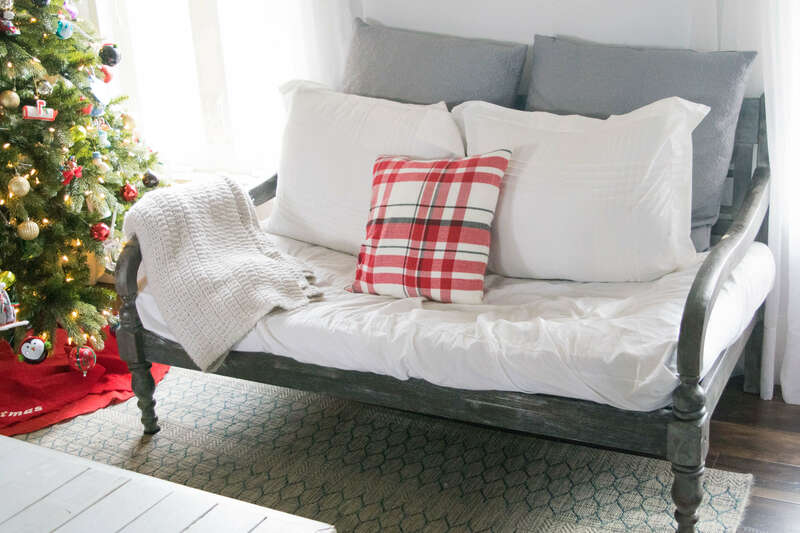 The reds and warm textures of blankets and pillows make everyone feel cozy instantly. A few years ago I splurged on monogrammed stockings and I love them! 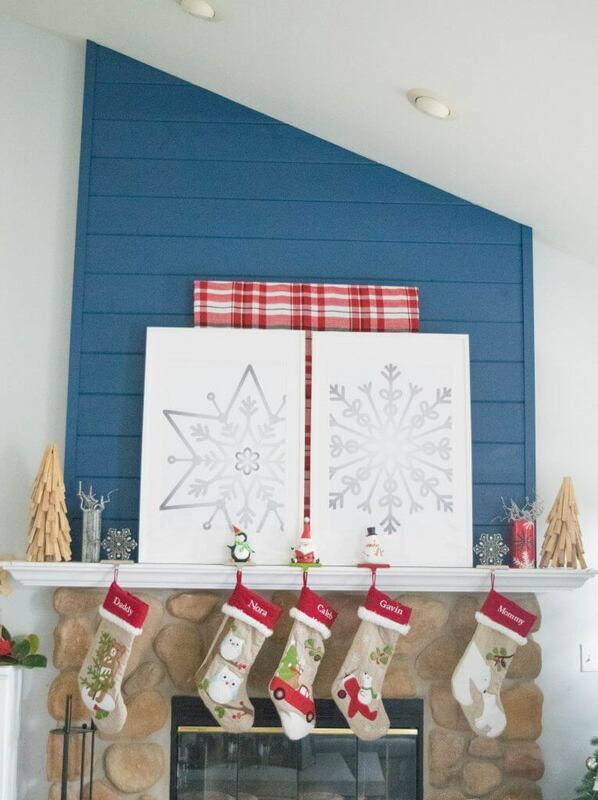 Growing up we actually waited until the night before Christmas to hang out stockings, but I love the look of them so much so my kids hang them up the day we are pulling out the Christmas decor. We created a new tradition! 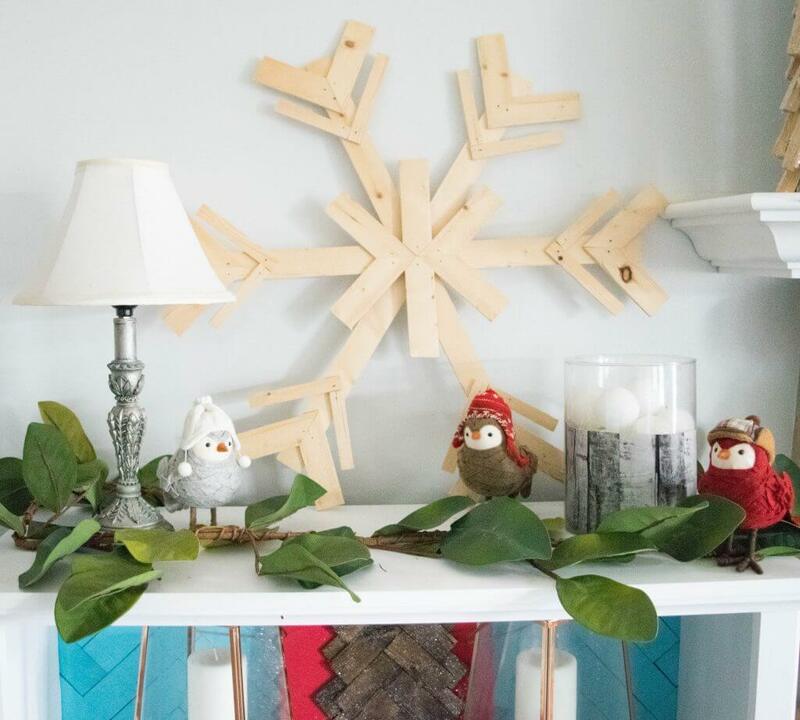 I always stress that decorating a home for each season can be expensive, which is why I DIY Christmas decor and make Holiday crafts. It is the only way I am able to decorate my home for Christmas without making my husband cringe and hold tight to the wallet. 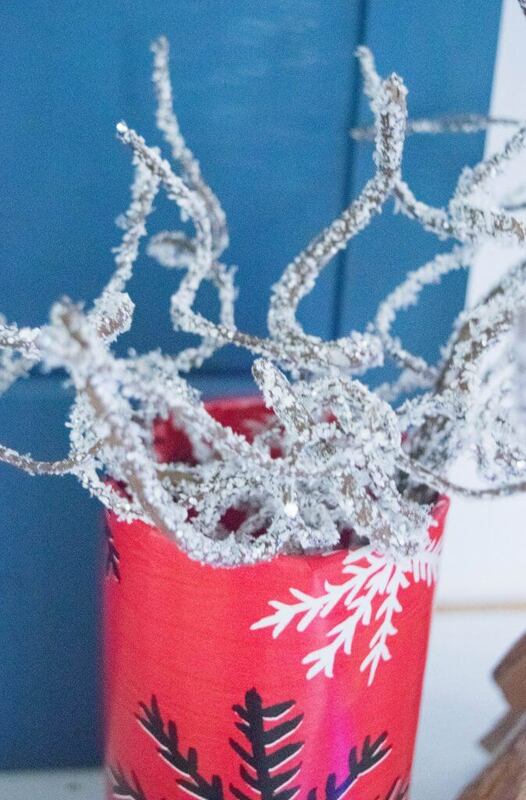 Making things on my own has allowed me to sprinkle in holiday items throughout my home without breaking the bank. 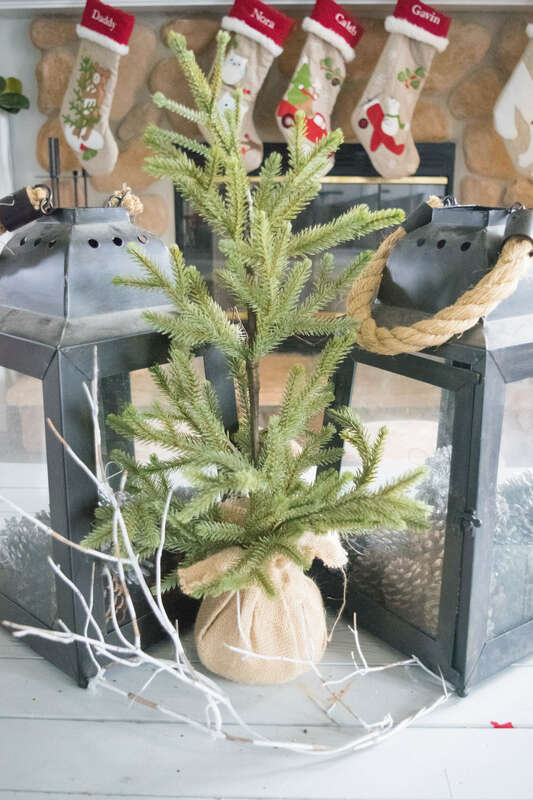 Because I save on my holiday decor by making a lot myself I am able to splurge on larger items like monogrammed stockings, a beautiful faux Christmas tree and still pay for those much needed Christmas gifts! Here is where things really changed in the last few weeks. 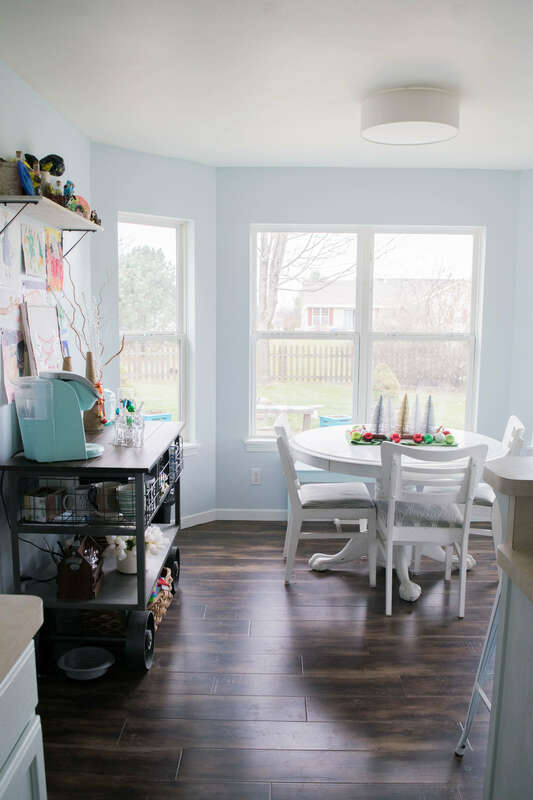 What was my kids art table and art room has become our full time dining room and table for now. 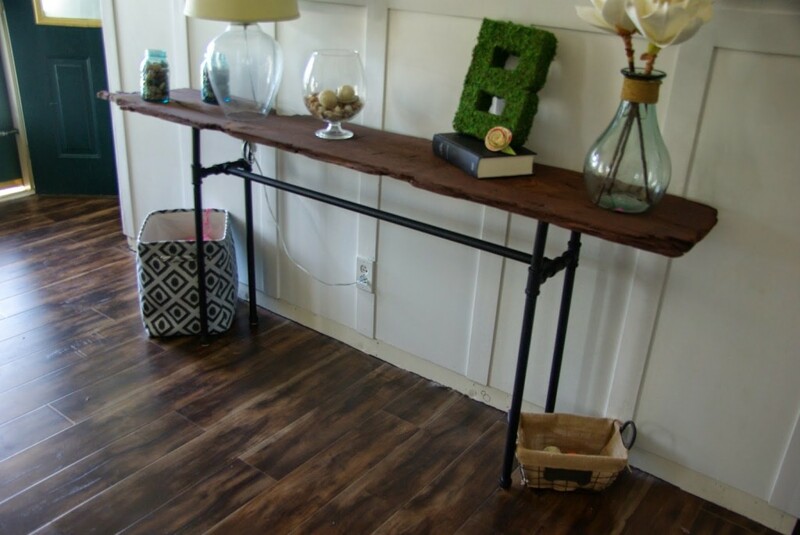 I am still mulling around ideas on where and which table we will use long term for our dining room. 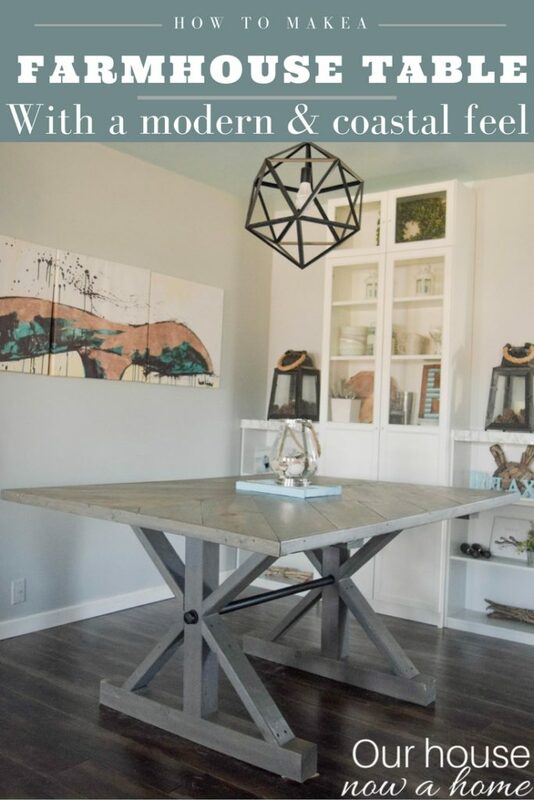 Potentially making a built in bench seating here, using the farm house table… so many possibilities! For now though we are rocking the smaller table, making it work with our family of 5 and cheering up the space with just a few smaller Christmas decor additions. 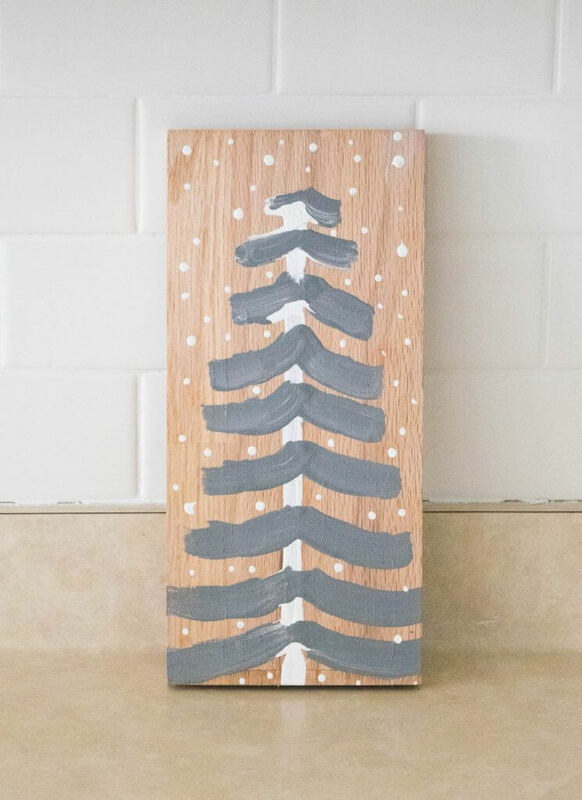 I keep the decor in our kitchen crazy simple, I am talking these little DIY wood Christmas signs and that is it! 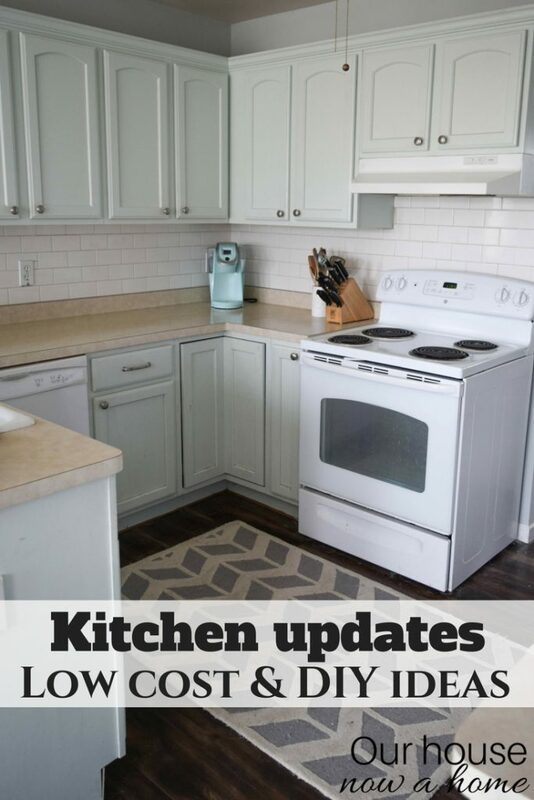 I would love to do more in here but we have a small kitchen. Every inch of the counter space needs to be used to food prep, no room for holiday decor unfortunately. I also kept the decor simple in the dining room too. 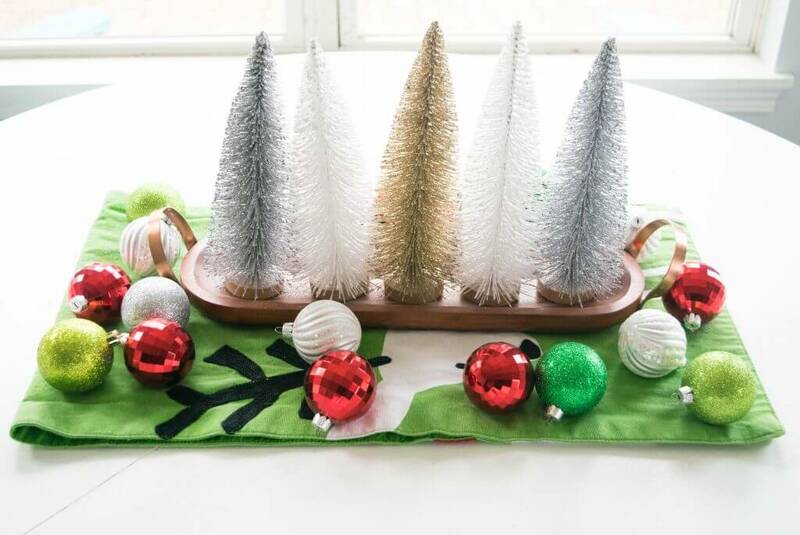 These bottle brush Christmas trees I picked up at Target for $3 each! 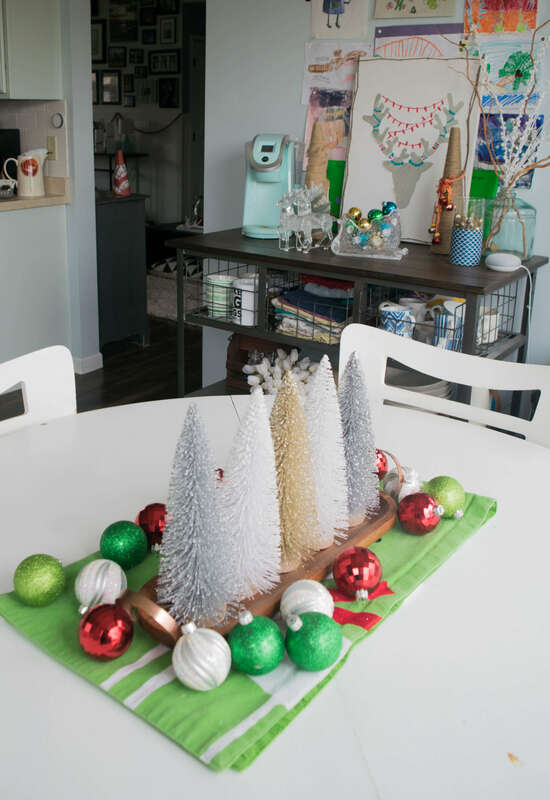 I used a bunch of ornaments and sprinkled them around the table runner. Easy stuff here, my kids helped me place these and I did this right before it was dinner time. I had planned to spruce it up more after dinner but fell in love with the simplicity and fun feel this gave the table. 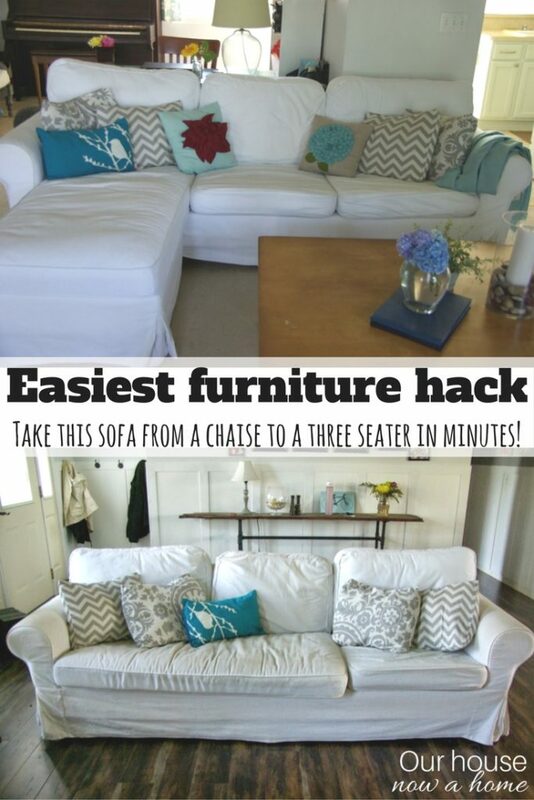 It carries off the whimsical feel that I have in the living room perfectly! Words to the wise though, do not do this unless the ornaments are shatter proof. These little colorful ornaments will attract kids big and small to play with them, no matter how well behaved they are. 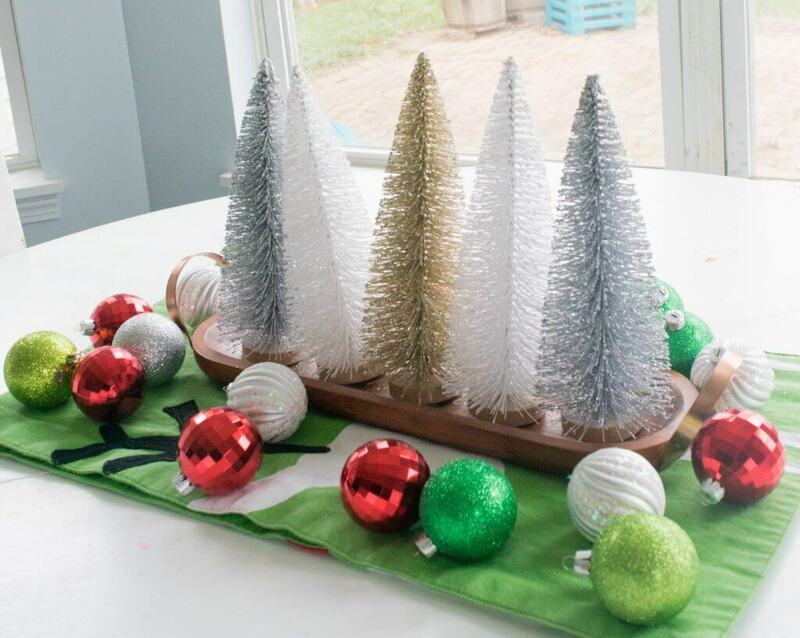 Glass ones should not be used for a center piece, no one can resist the shiny ornaments. This kitchen cart is so functional for us and my kids art is displayed here. 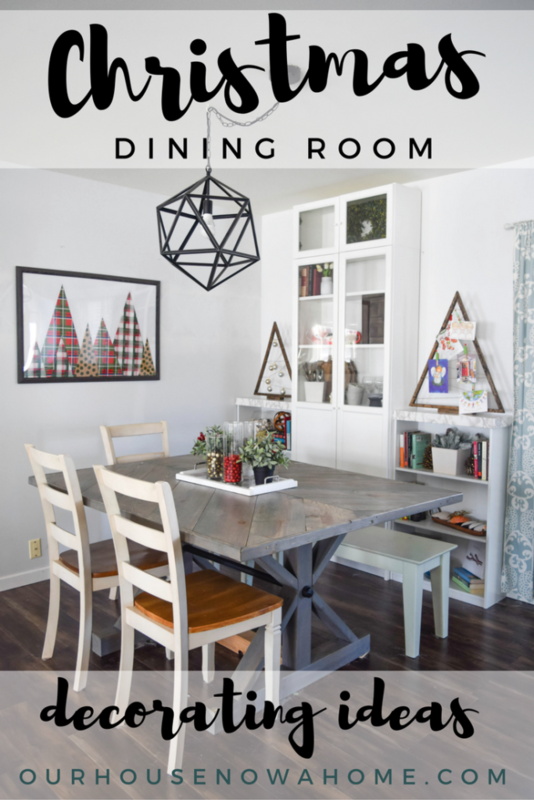 There is a lot going on in this little corner of the dining room, so I again kept the Christmas decorations minimal. 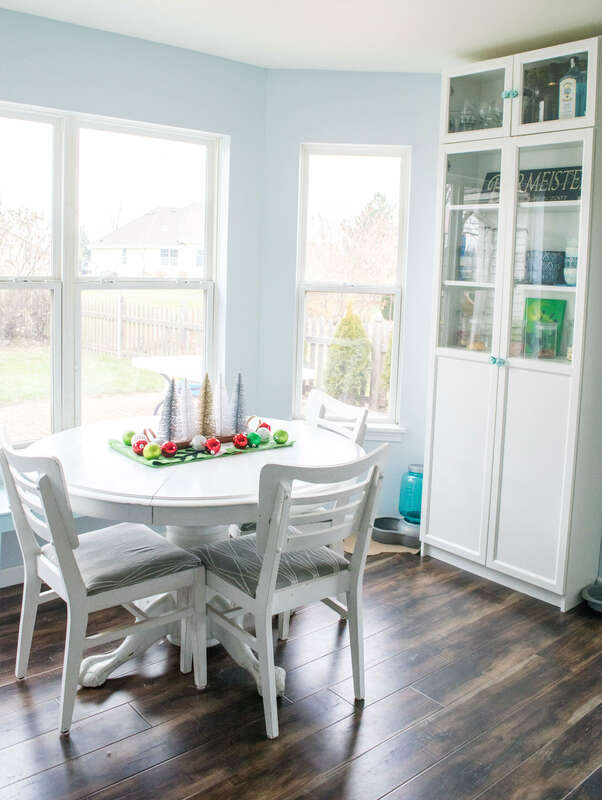 Too much decor and feel like clutter way too fast, simplicity was the feel I tended to gravitate towards in this kitchen and dining room. The coziest of cozy spots in our home is the family room! This is the place we cuddle together and watch Christmas movies, holiday specials and my kids go to place to read. 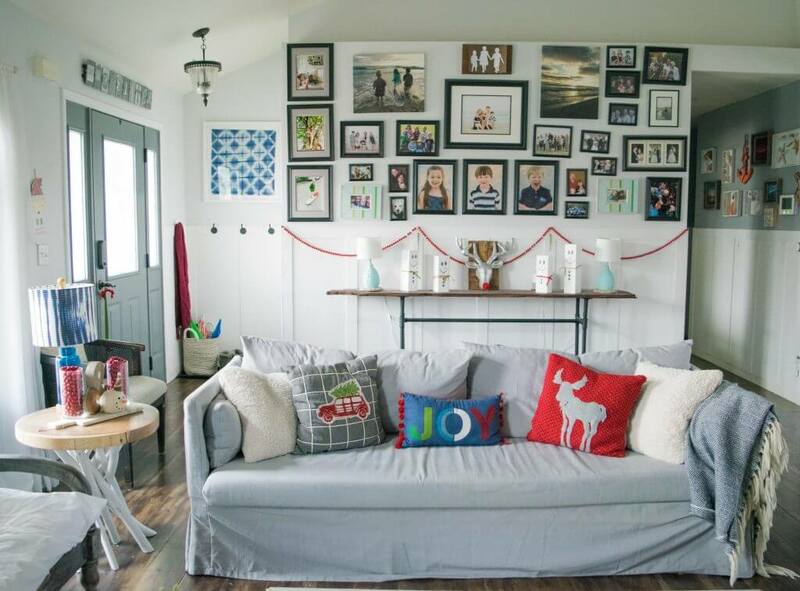 In this room I went with a more muted Christmas color scheme with a few pops of green and red but mainly gray and white. With the blue ceiling and it being open into the living room it needs to stand alone but also mesh with the rest of the home. It is also a small room and so I like to keep things low key with decor. 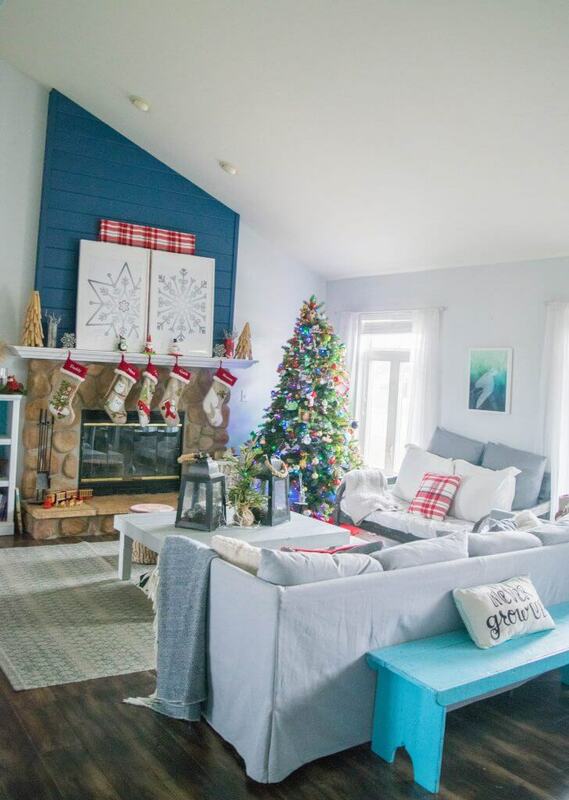 I let the color and Christmas explosion happen in the living room, in here it is more calm. 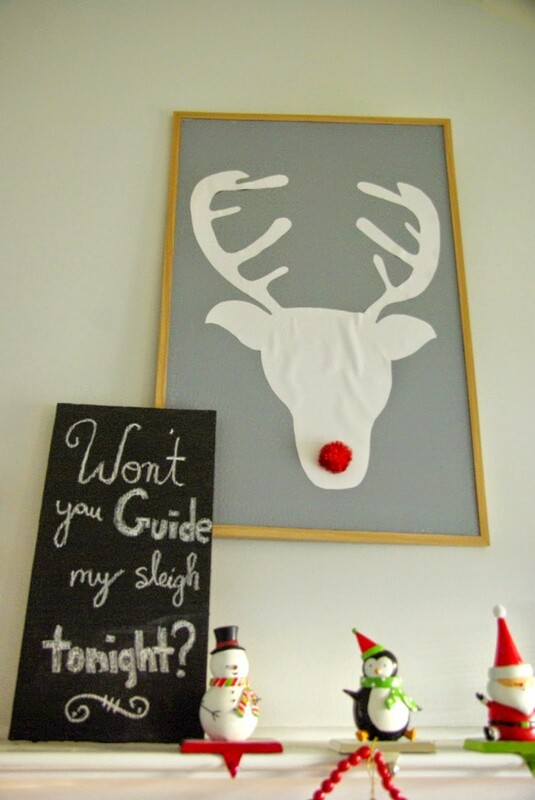 Here is another of my Christmas free printables that I will be sharing with you all on Friday! 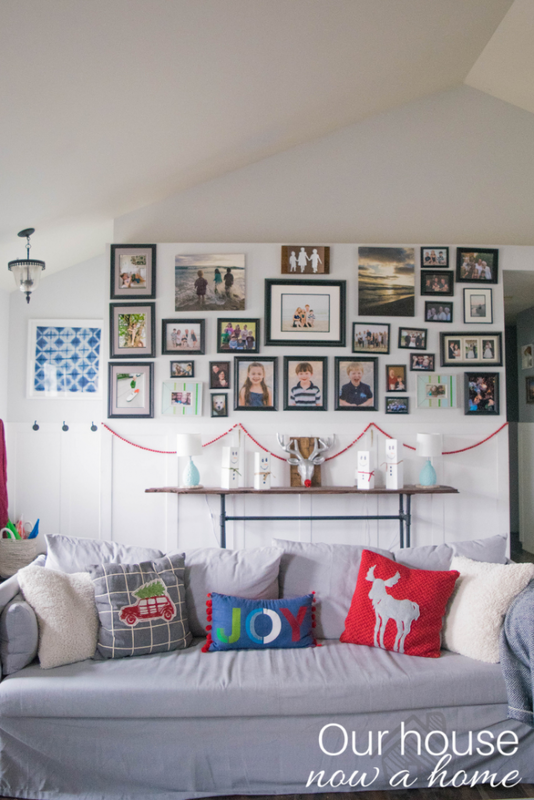 I had a lot of fun creating these holiday wall art and hope you can find some treasures to add to your wall too. Oh guys, this view hits me with Christmas cheer so much! We had dinner by the fire last night, Christmas music was playing, the lights were twinkling and the snow was falling. It felt magical! Even with the blizzard happening outside and my yearning for summer already I do adore this little part of winter. The holiday season is where it is at, and getting to have a white Christmas pretty much makes my Southern California native heart explode with happiness. But, once January comes it can warm right up! On a side and functional note, all of the blanket throws I have scattered throughout our home are for a purpose. 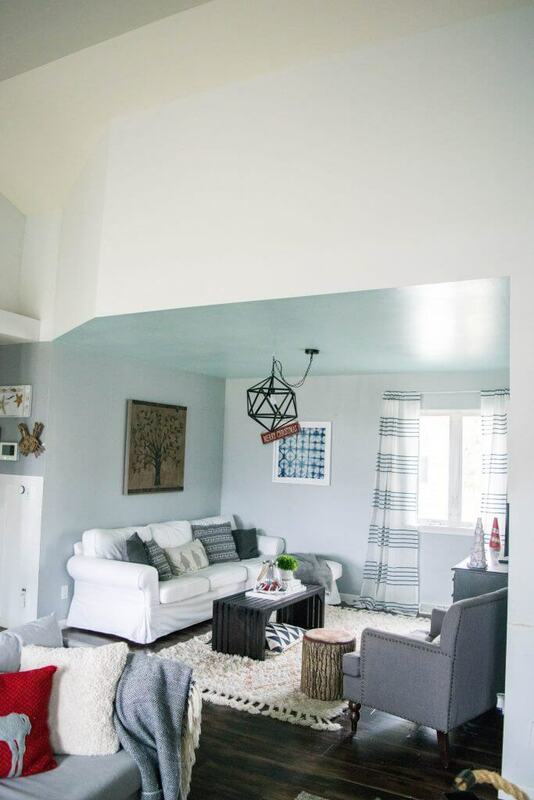 This vaulted ceiling in the living room, which I typically do not share wide shots of here make our home feel cold no matter how much I turn up the heat. Just a reality of living in Wisconsin, this time of year it is freezing! I was a big Grinch earlier this month. I mourned the end of summer and took it hard when the weather got cold. But once I took down the fall decor and the kids helped me bring the Christmas decor up from the basement, with each item I took out of the boxes and found a place for in my home it thawed my Grinch like heart. Now, sitting here with the twinkling lights, cozy red pillows, stockings hung and the Christmas magic has hit me too! 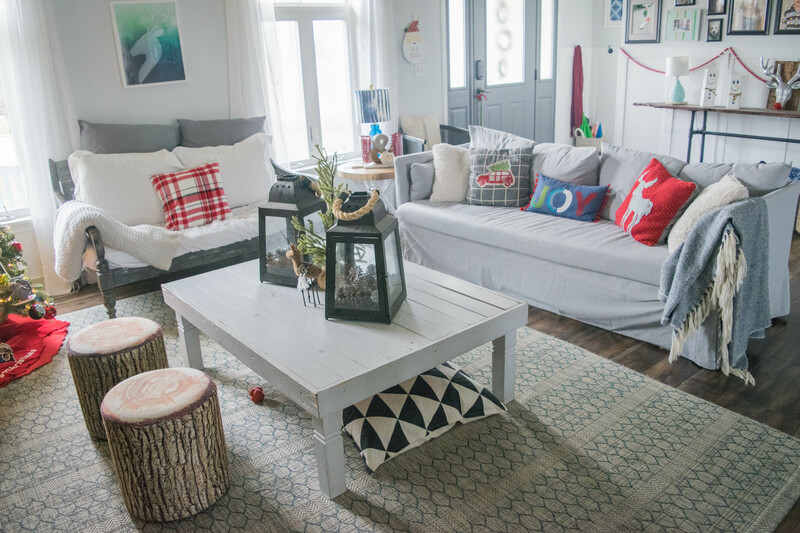 I hope you found a few nuggets of inspiration with my Cozy & Simple Christmas home tour, and if you were feeling like me and hesitant to jump into this holiday season… jump in! The magic of the season hits you hard and it is so much fun! I can bask in it, relax in my home all while avoiding actually stepping outside in the wet snow and ignore the fact that I have purchased not one gift yet. 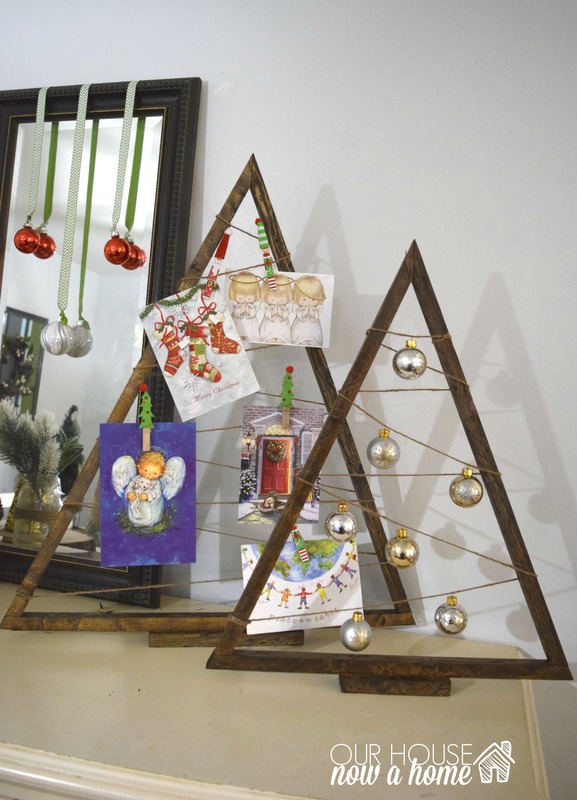 One thing at a time, today I am all about the inspiration for Christmas! 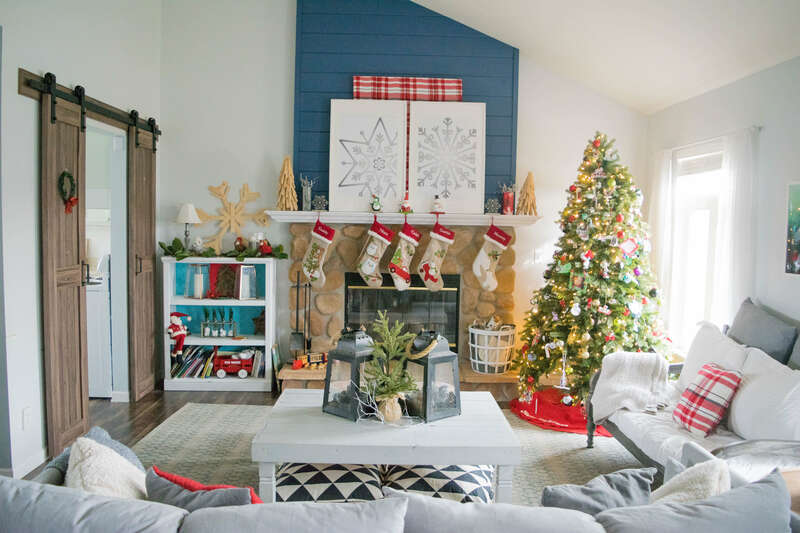 Be sure to check out all of the talented bloggers and their beautiful homes all week long, head on over to Casa Watkins living to see her eclectic and color filled Christmas decor! 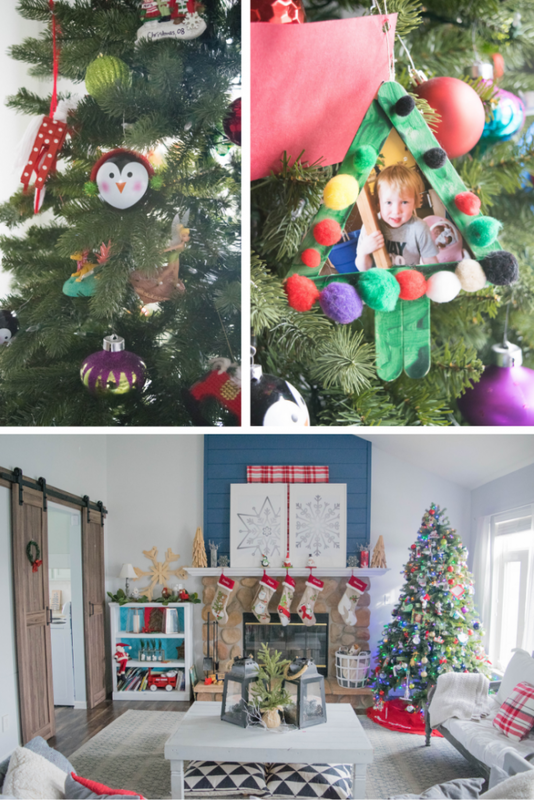 I love how festive your house looks! It’s very warm and inviting. Everything looks perfect for the holidays. This is all so festive and fun! Love the little pom pom for Rudolph’s nose!! 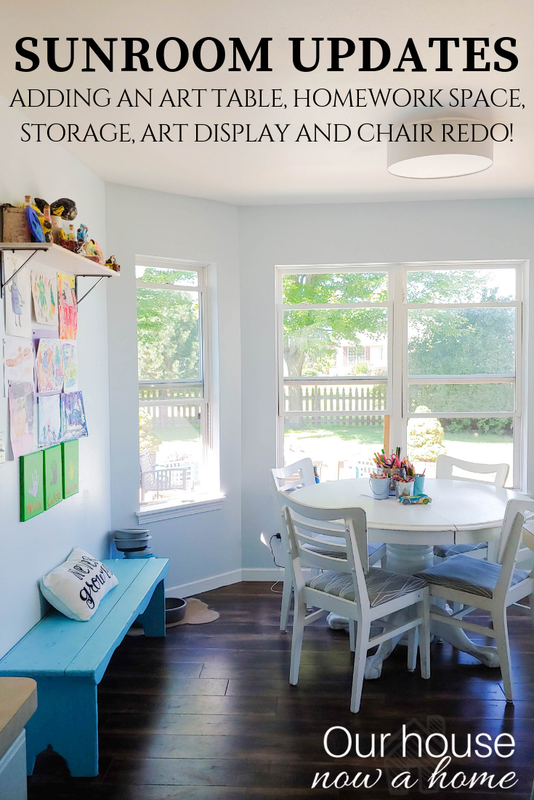 I love all the colors in your home! So festive. 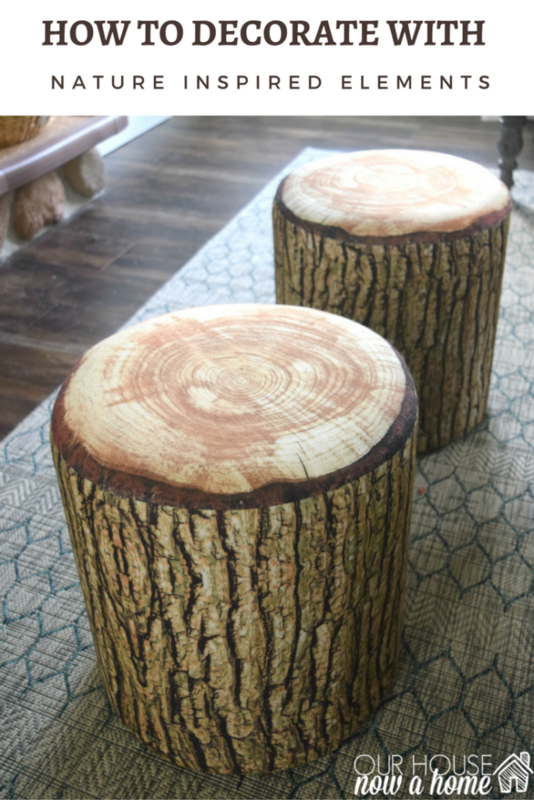 My kids would be all about this 🙂 Great DIY projects throughout too! 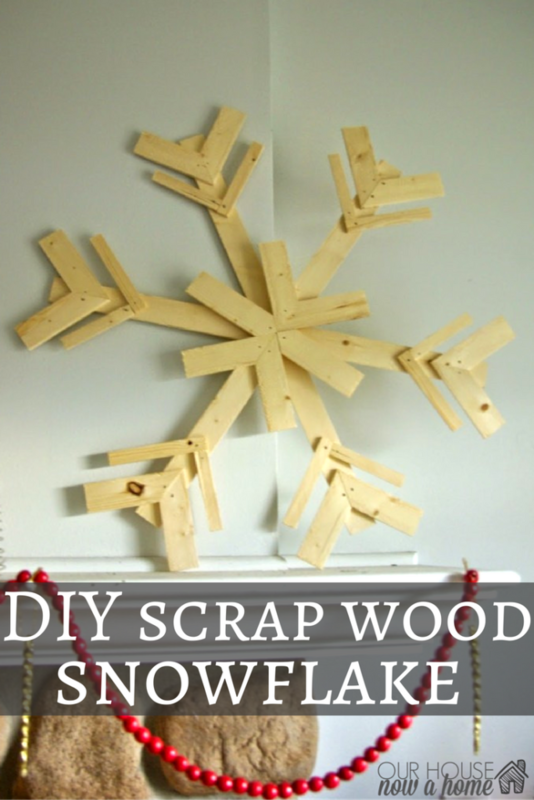 I love love love your snowflake art about the fireplace! Your stockings are so precious! I also love the dining room table centerpiece. 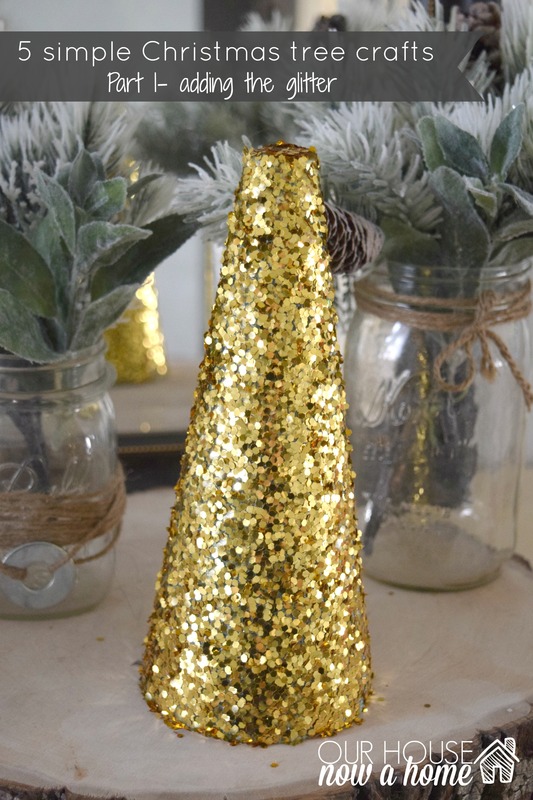 Anything with glitter and color screams the holidays to me! 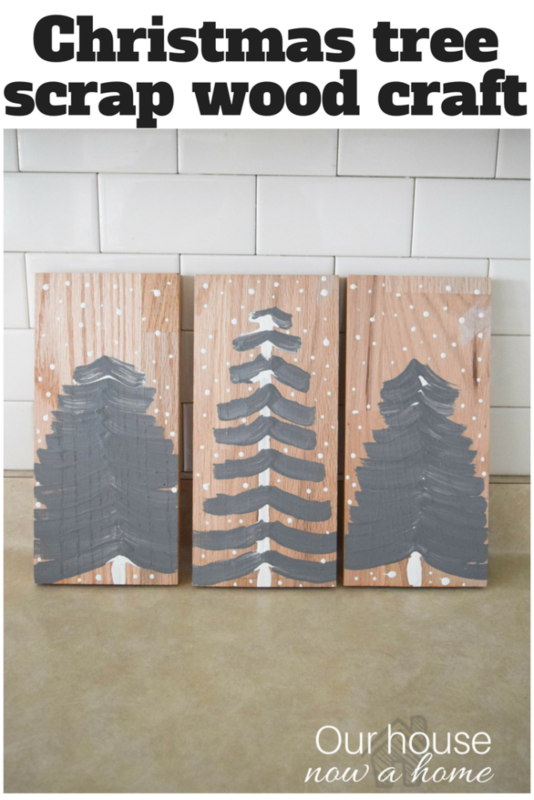 Your new DIY holiday art is such a fabulous addition. I absolutely love it, Emily! Wow! 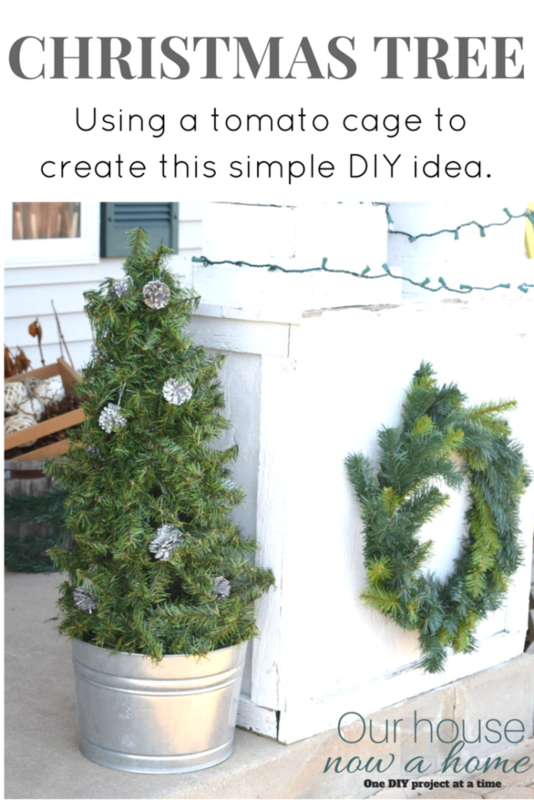 So cute and so many ideas! Love it! I love everything! We are moving this week and I can’t wait to decorate. 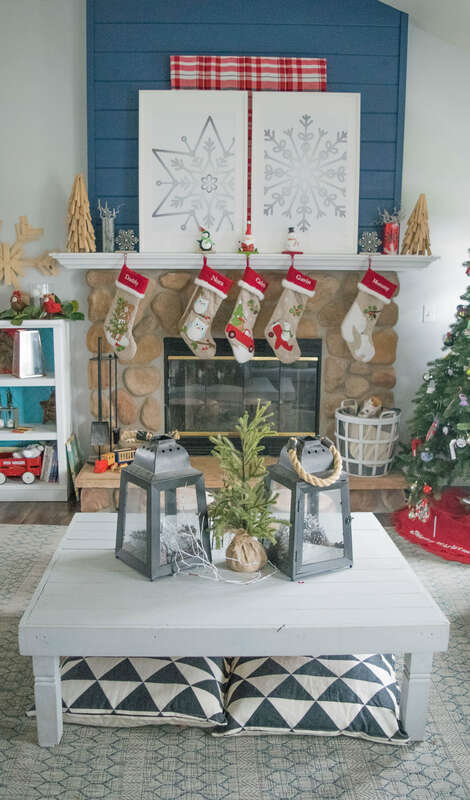 I love all of the cozy touches – especially those snowflake prints on the mantel. Thanks for sharing! Emily I love that you bring in so many of your Christmas crafts. 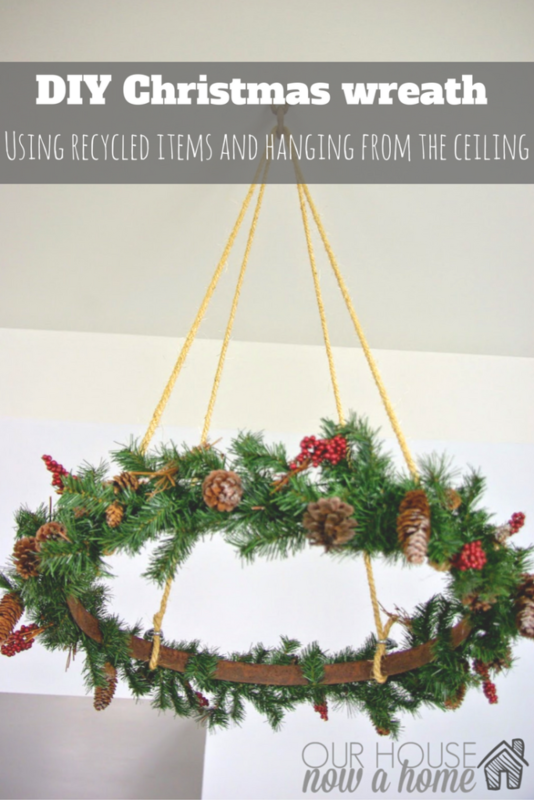 I love crafting during the holidays and you have incorporated them into your home wonderfully! All these photos are absolutely gorgeous. I so wish I was decorating for the holidays but since we will be gone I decided not to. Luckily the cabin we rented will be decorated for us. I am excited about that. I am not ready to decorate yet. I need to get some more festive ideas. 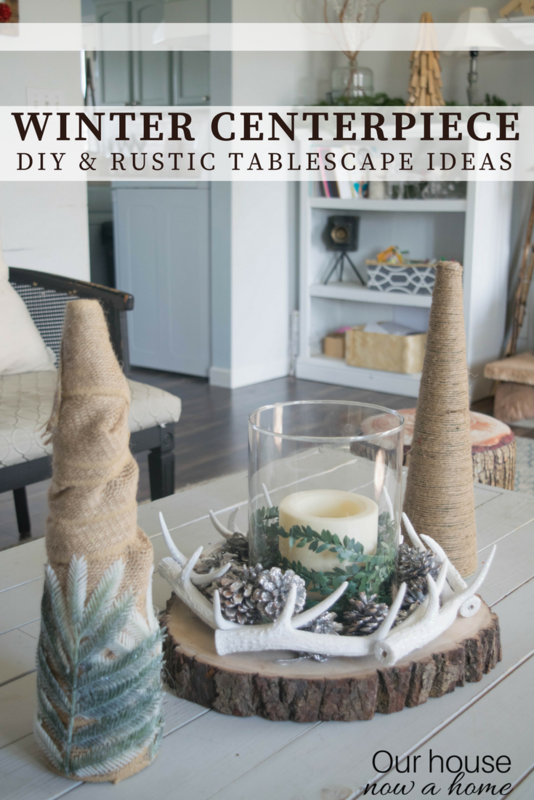 I love that all these ideas are so easy that anyone can make! Christmas is the perfect period to try them! I love the decor you chose, thank you for the tour. I love how warm it feels and I bet you will have a great Christmas there. Your home looks absolutely wonderful all decked out for Christmas Emily! 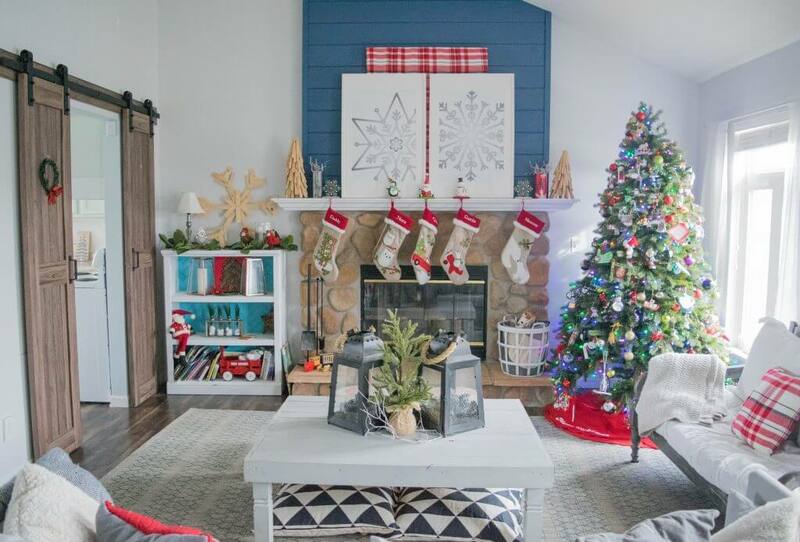 That blue fireplace wall is just stunning. Cozy indeed! And so pretty! 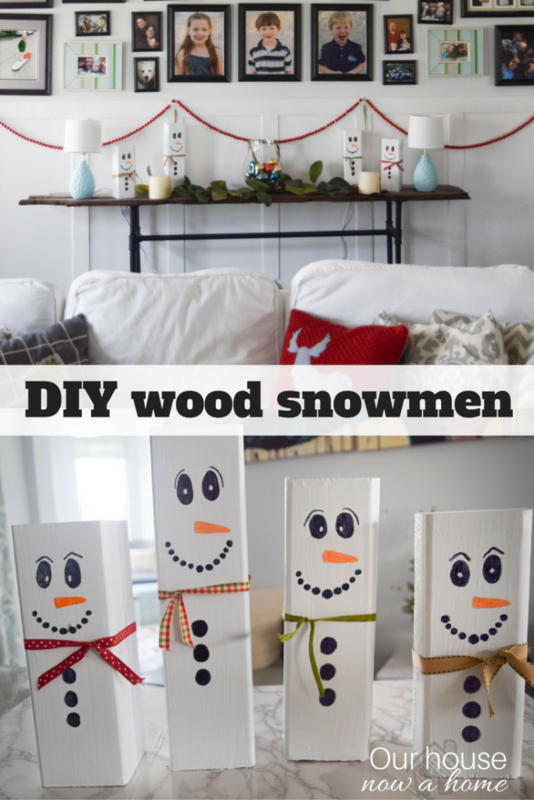 Those snowmen are adorable. 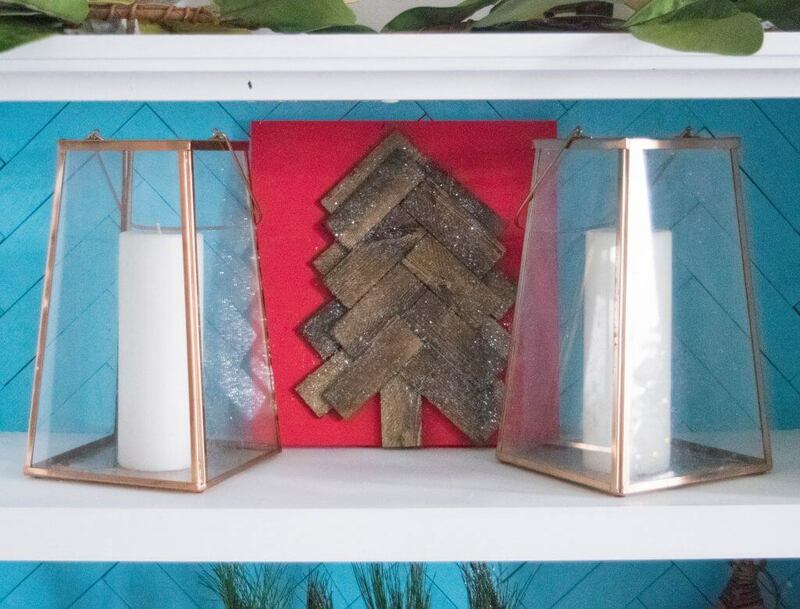 I love adding plaid to my Christmas decor too. 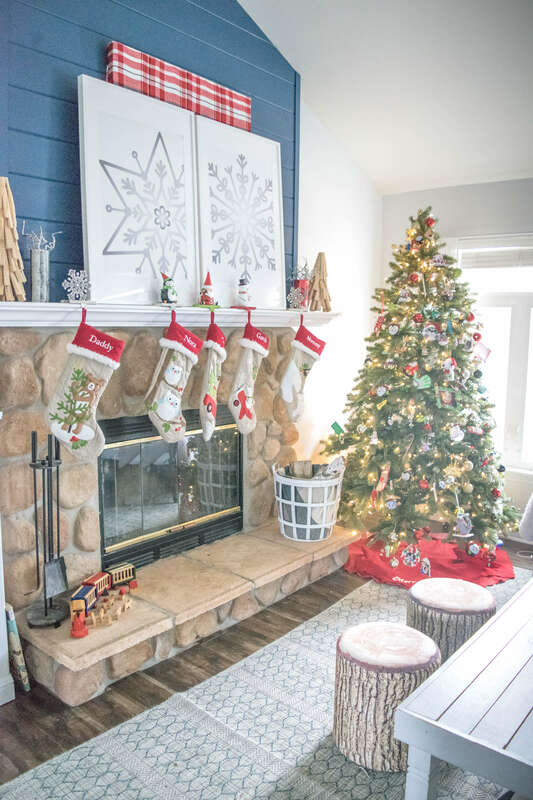 Your home looks so festive! It’s very warm and inviting – perfect for the holidays! And I love the monogrammed stockings!! I love all of your festive touches! You’ve given me so many great ideas. Can’t wait to get started! Love all of your DIY Christmas decorations. Your home looks so festive and cozy! 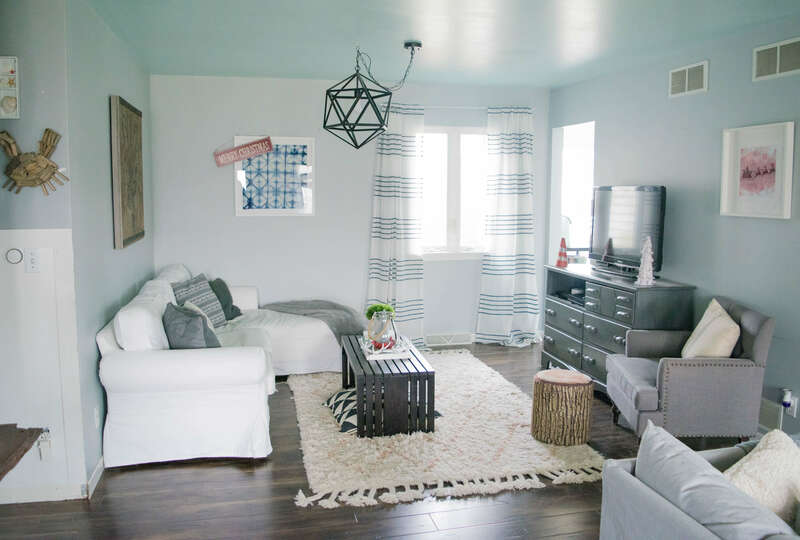 Your home is so cozy and welcoming, Emily & you are an amazing decorator!! I just want to sit down and use that Keurig right this second, and then walk around and LOOK. 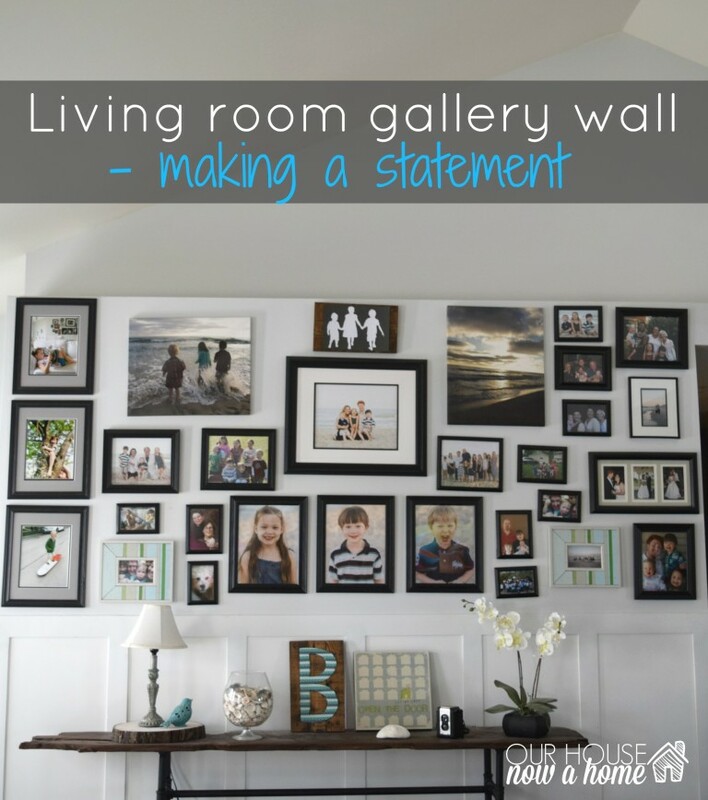 The gallery wall is PERFECTION!! I hope you have a sweet Christmas with your cute family!! I love how colorful and whimsical your holiday home is! 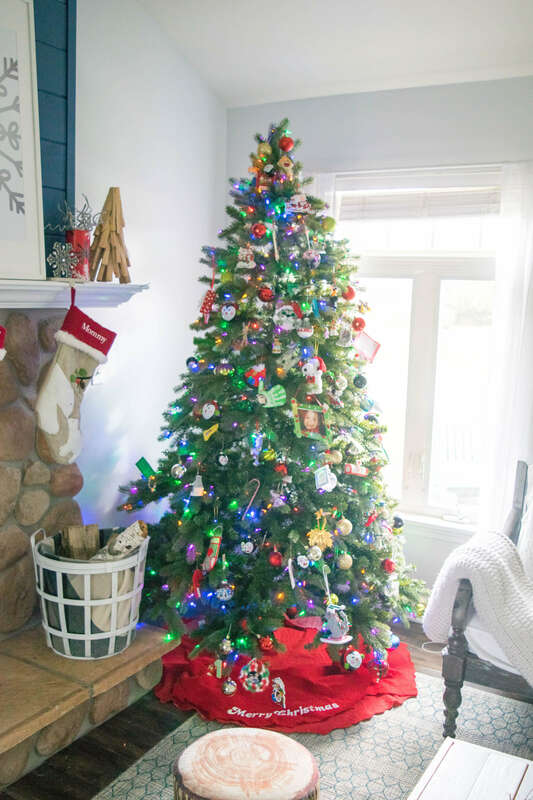 Our tree is exactly the same- full of homemade ornaments and those passed down to us from prior generations, and we love it! 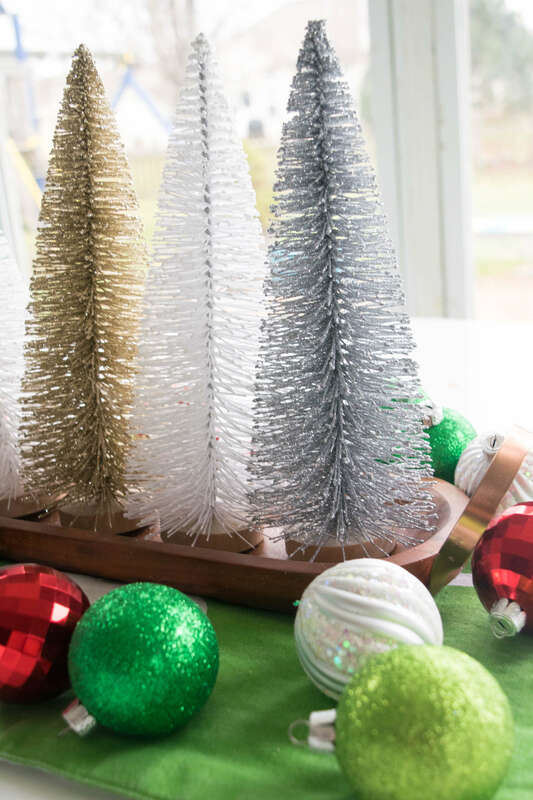 These look like some great Christmas decorations! I love this time of year! Everything looks so cozy and family friendly! 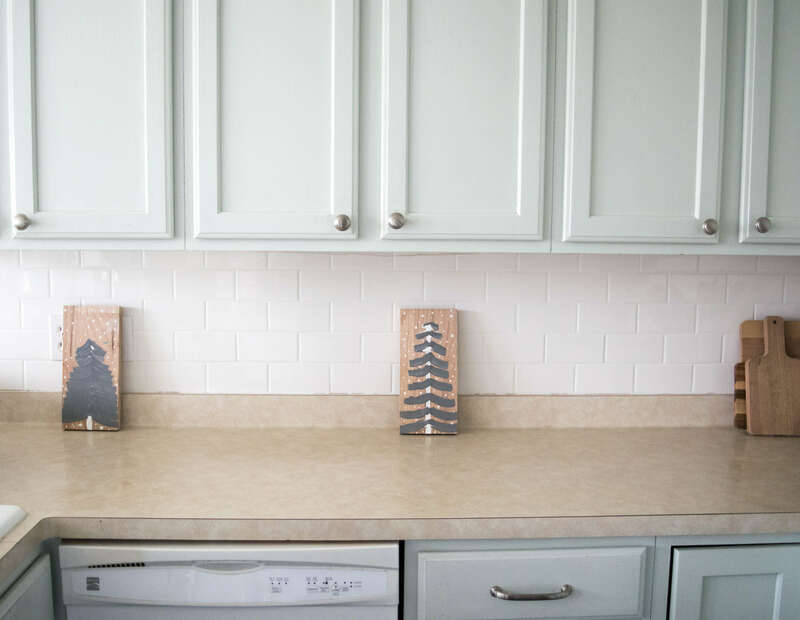 I love the little wooden trees in the kitchen! 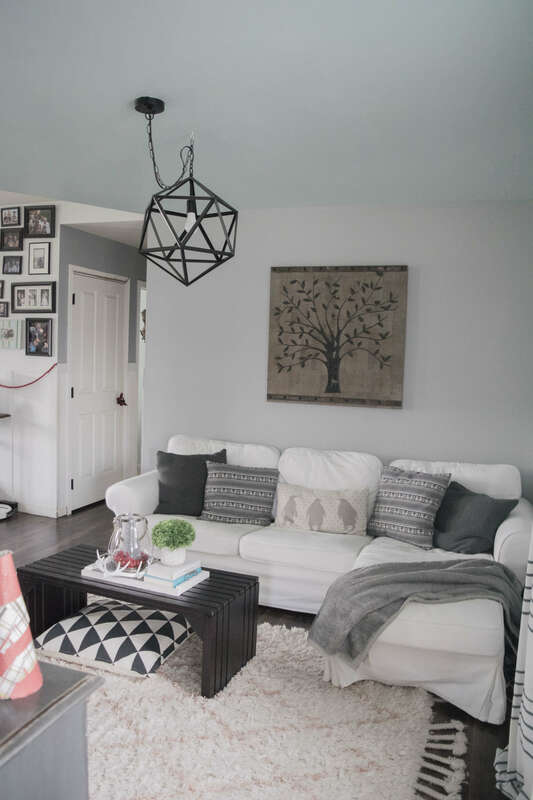 I love your decorating style so much! 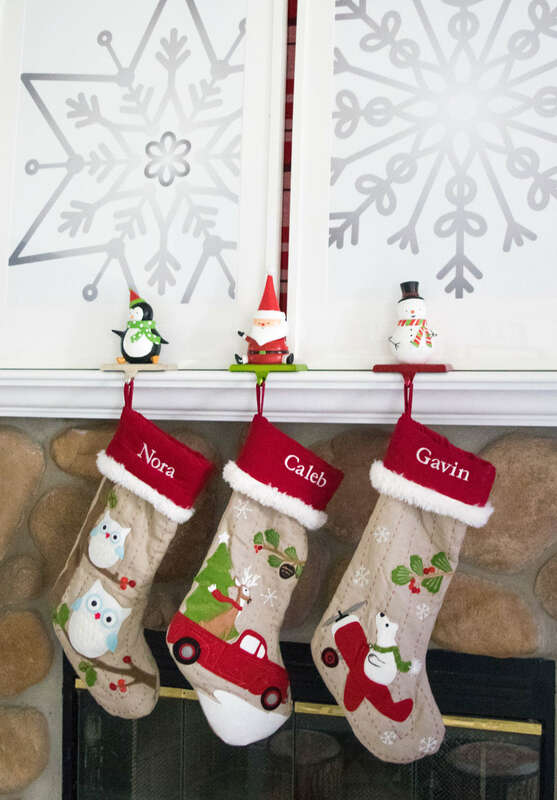 Your stockings are adorable, I want to get personalized ones for my family. 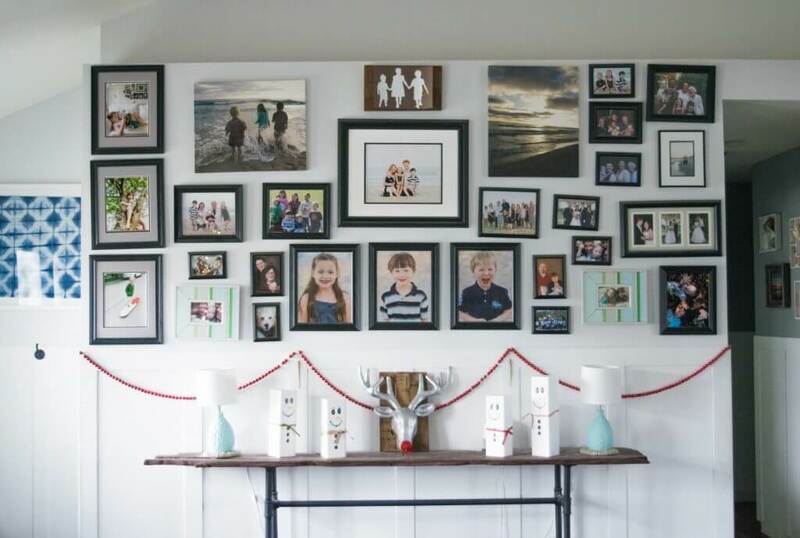 And the wall of photos is amazing! 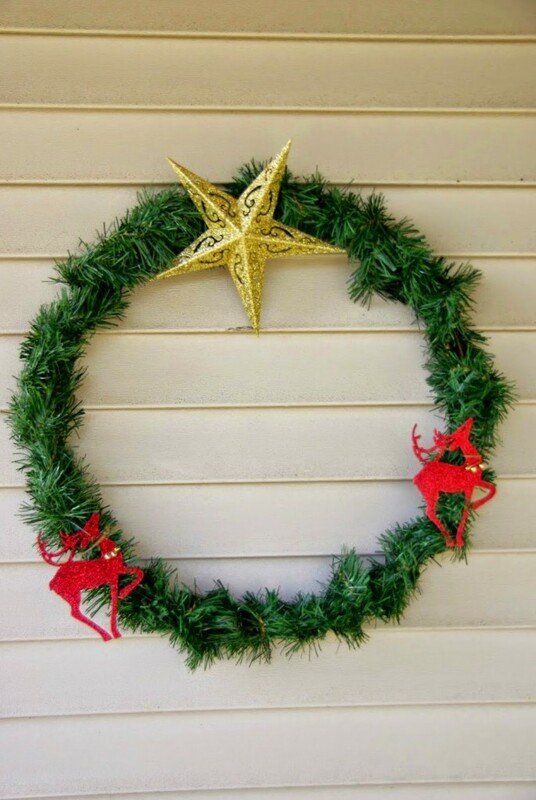 Your home is so pretty decorated for Christmas, Emily! 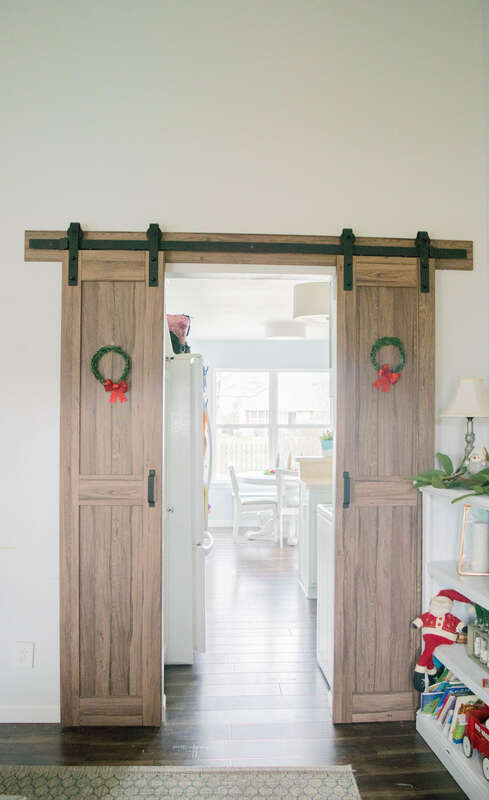 You have done so much to make it a beautiful space for your family to enjoy during the Holidays!